Everyone should be very proud of how well they performed during testing! 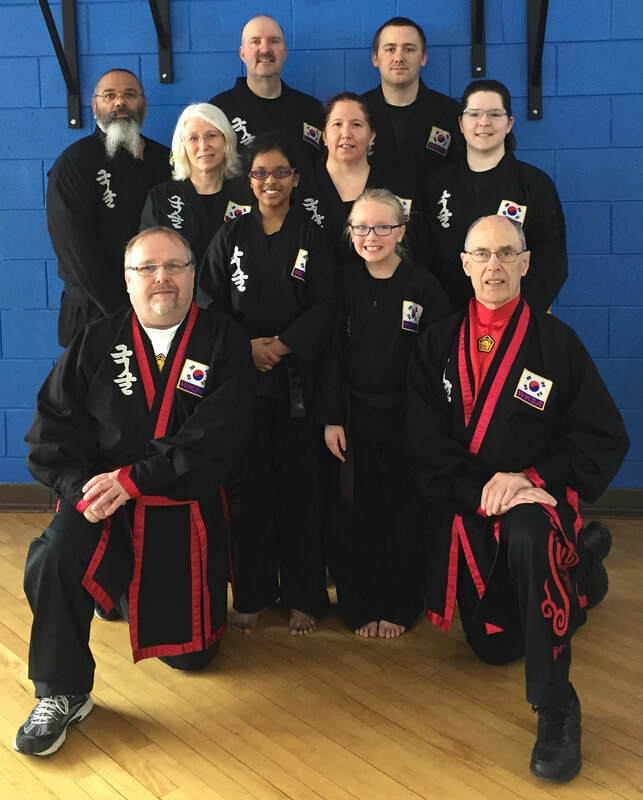 You certainly make your Instructors proud. Thank you JKN Dena for partnering with JKN Barbara. 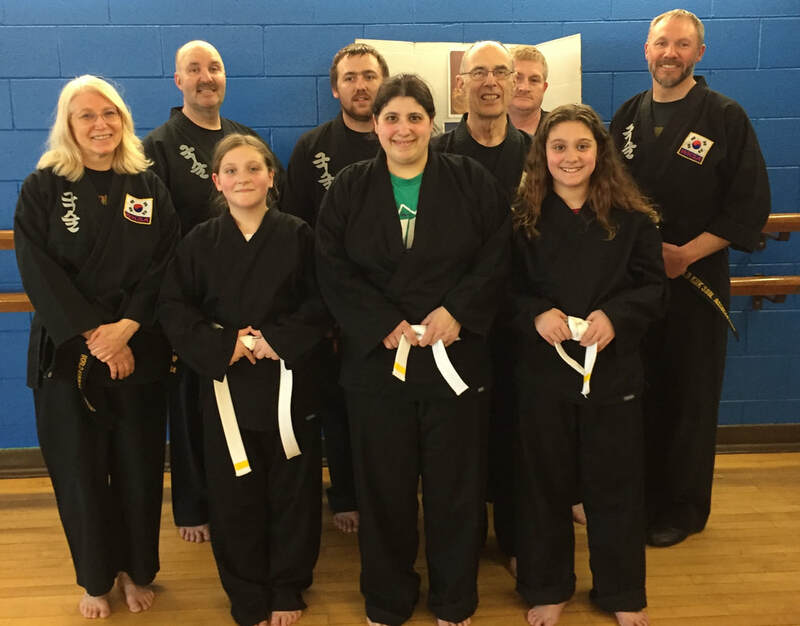 Deanna Staser promotes to Yellow Belt. 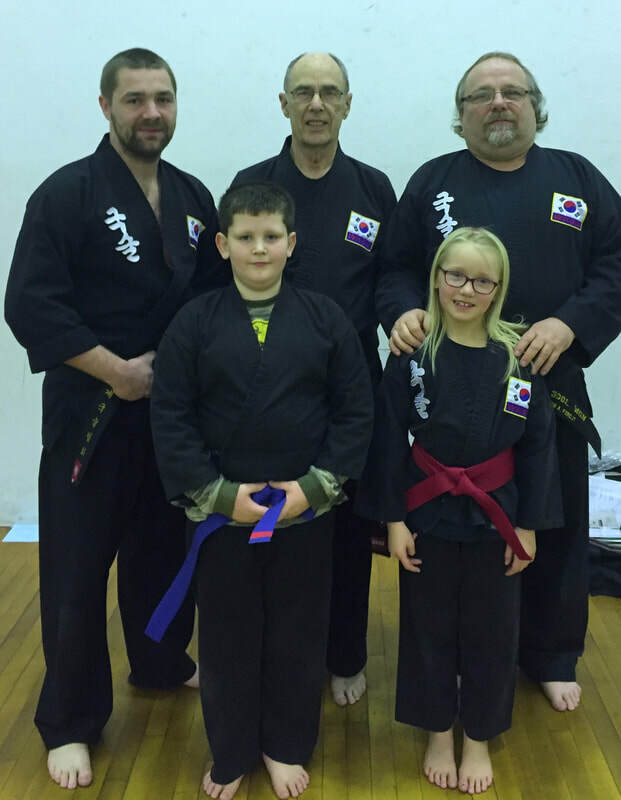 Wesley & Caleb Klier promote to Blue Belt. 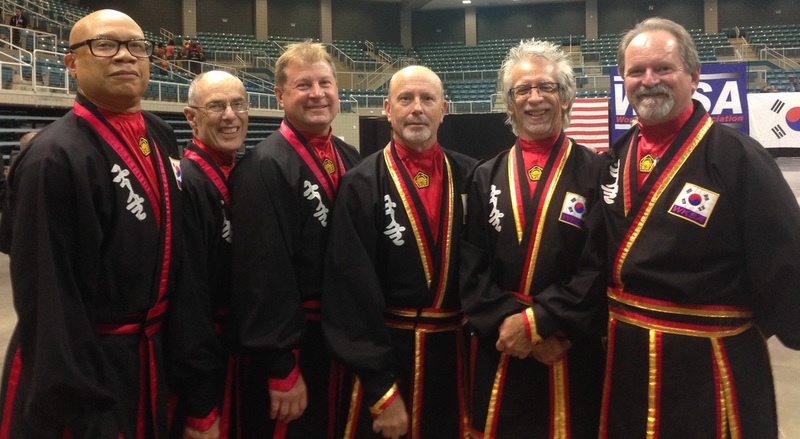 The 2018 WKSA Kuk Sool Won World Championship Tournament was held in Galveston, Texas October 6th. 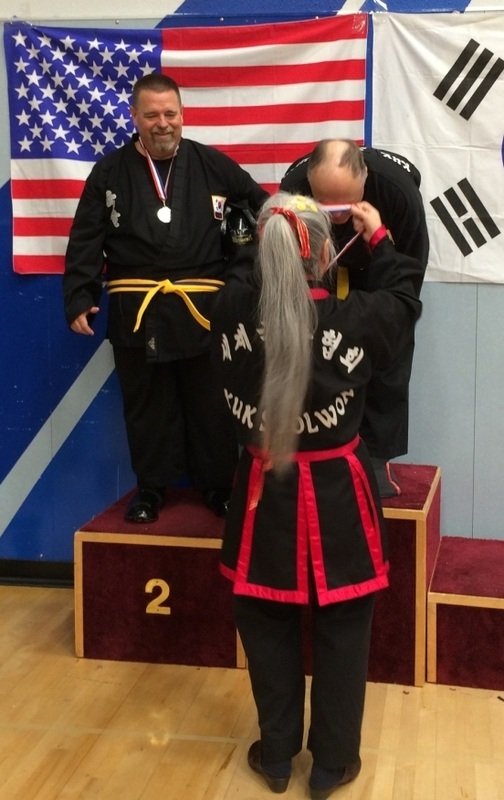 1,200 competitors competed for medals, a Korean Demonstration team performed, and there were promotions to Master level. Benjamin Forejt and his son Benjamin Forejt II from Sault Ste. 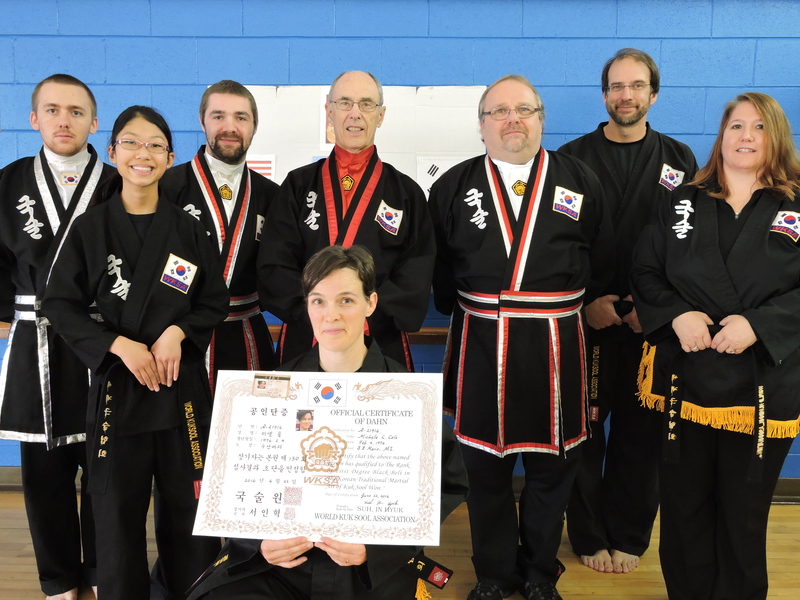 Marie, Michigan promoted to 5th degree. 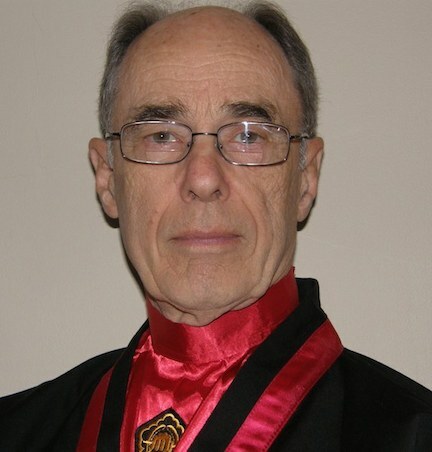 Monty Pinder from Sault Ste. 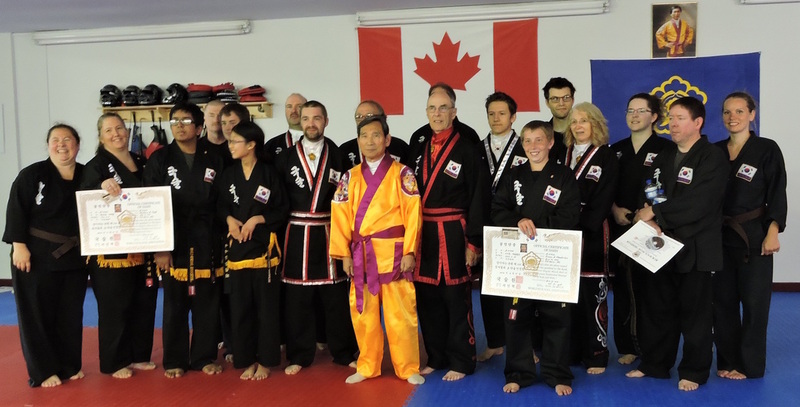 Marie, Ontario promoted to 6th degree. Excellent effort everyone! Thank you PKJN Forejt & SBN Miller for assisting with testing. 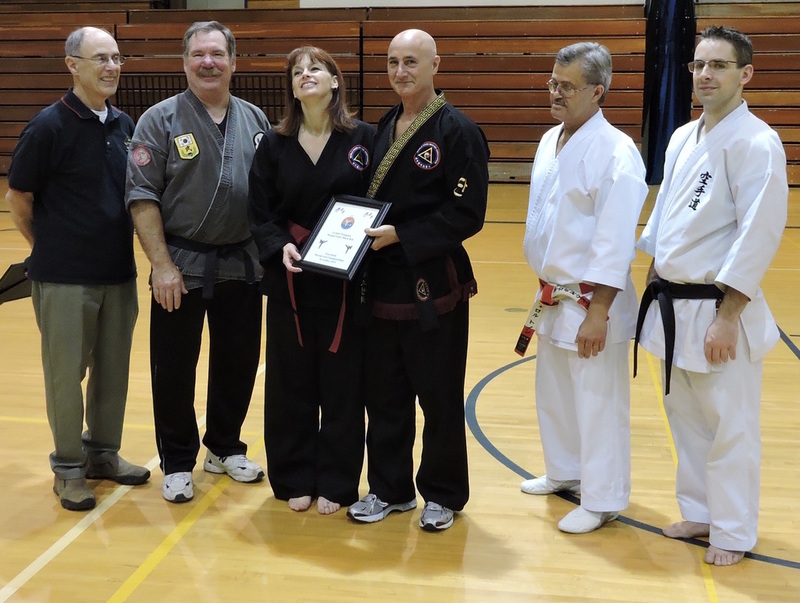 KSN Jinny, "Thank you! ", for helping inform the students of LSSU about our Martial Art Classes! 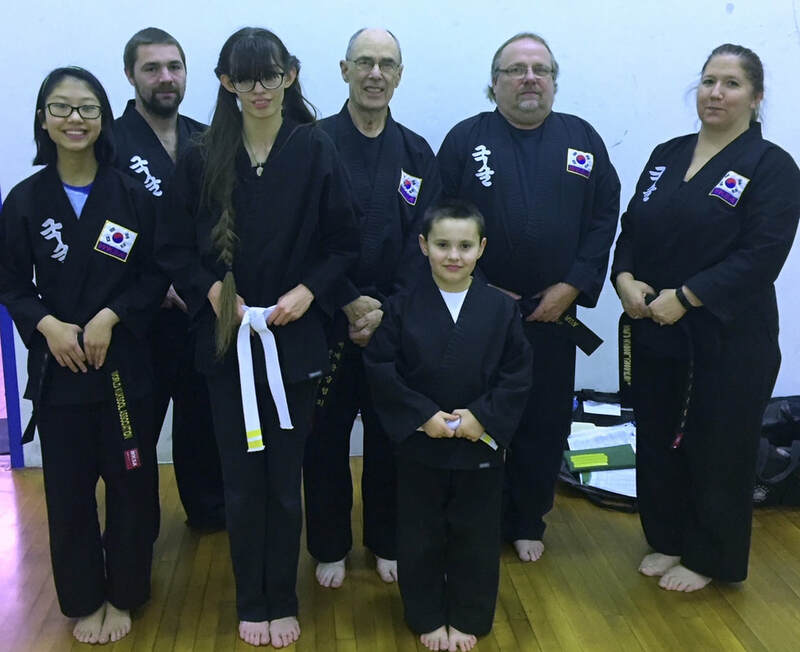 6 white belt stripe promotions Left to right Charlotte York, Caylie York, Caleb Klier, Landon Cameron, Wesley Klier, and in the front Emma Folkersma. 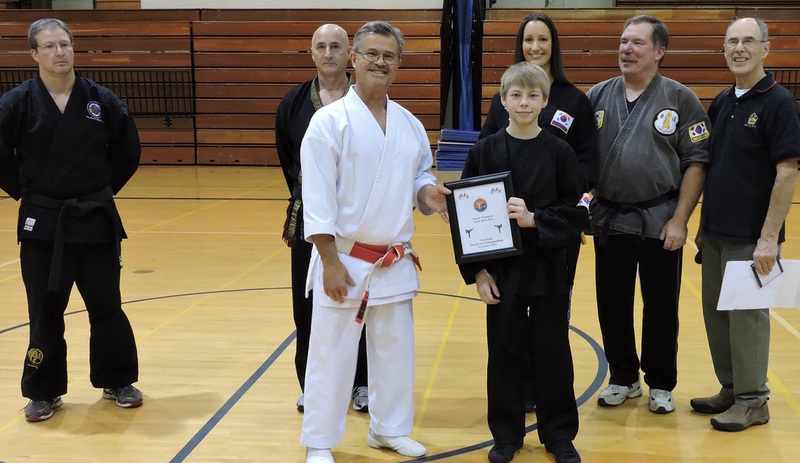 One red belt promotion Ford Laux with his complimentary sword. Joseph Cole receiving his 4th yellow stripe. 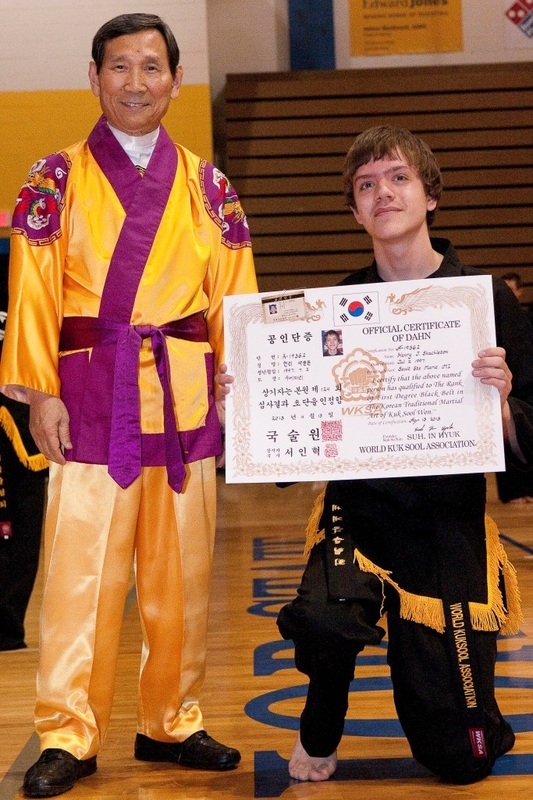 Dahn Bo Nim and Black Belts you may be very proud of your performance. 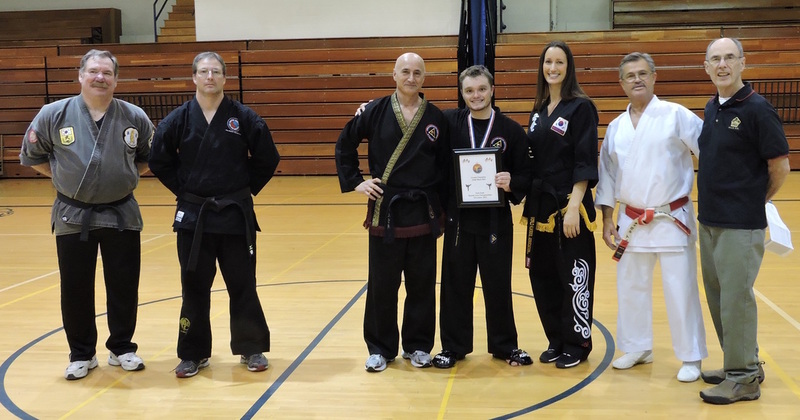 You made your Instructors proud. 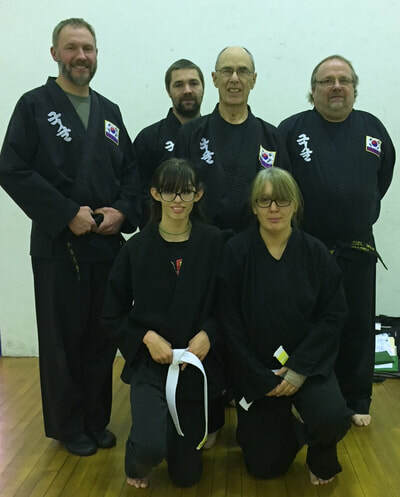 Congratulations to Kyo Sa Nim Jinny Harrow, Kyo Sa Nim Tim Harrow and Jo Kyo Nim Wyatt Landreville!! 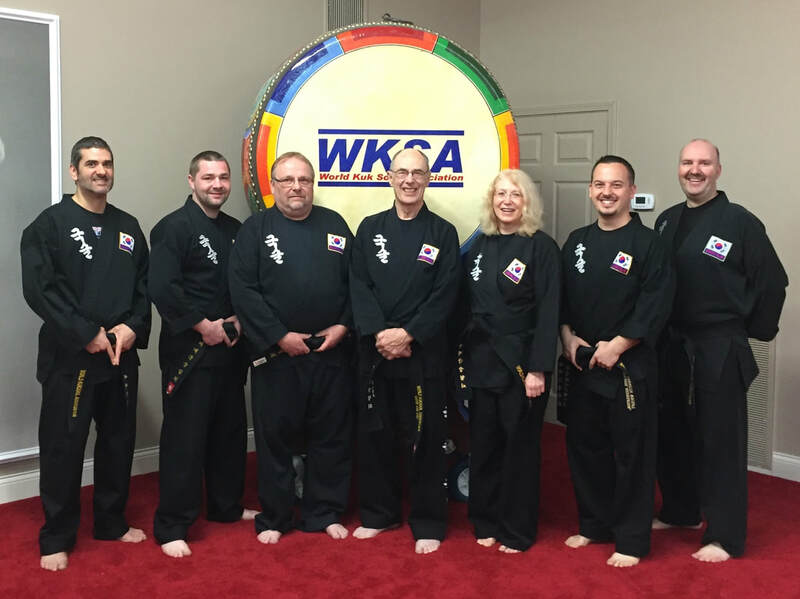 Our Michigan Kuk Sool Won Schools were well represented at the 2018 Continuing Education Program held in Magnolia, Texas. 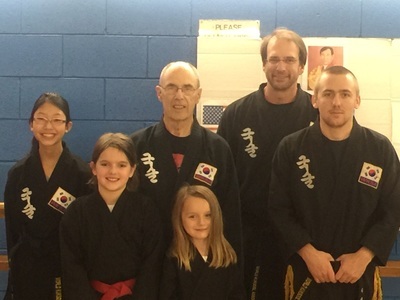 Ford Laux promoted to 1st red stripe, Madison Lee promoted to full red belt. 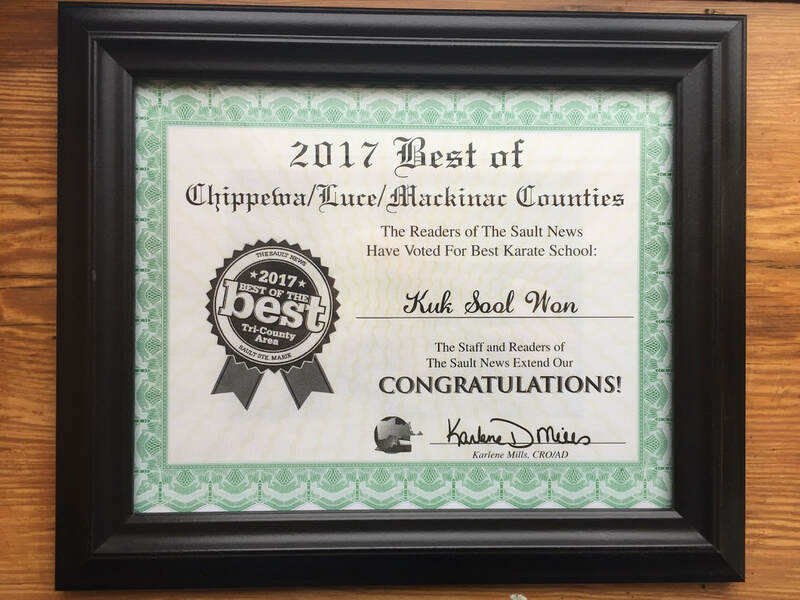 Our "Thanks!" to everyone who voted for our classes. 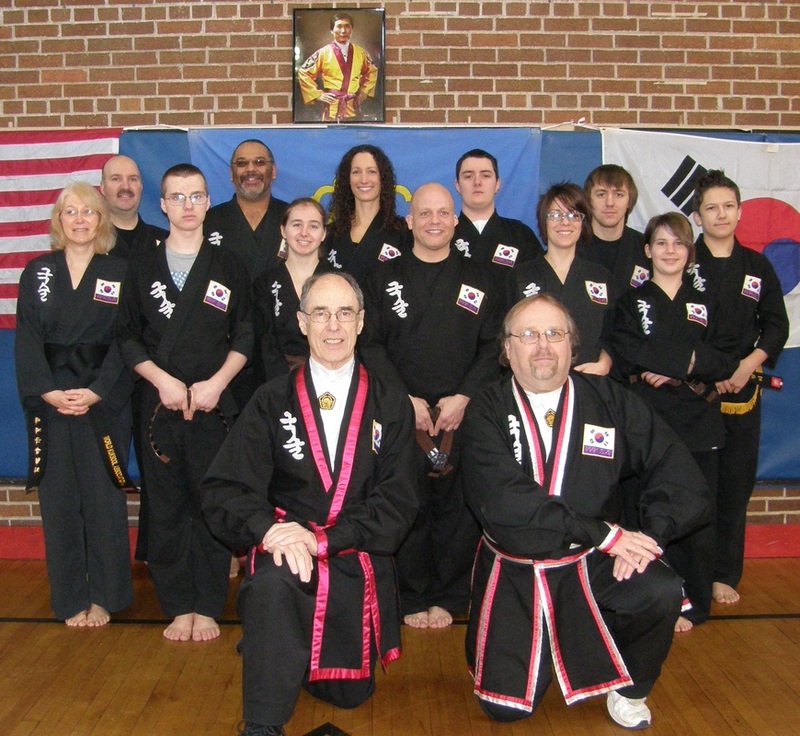 Feel free to try a free class to see if you may enjoy training with us. M, T, W & Th 6:00 to 7:00 p.m. in the Norris Center on the campus of LSSU. 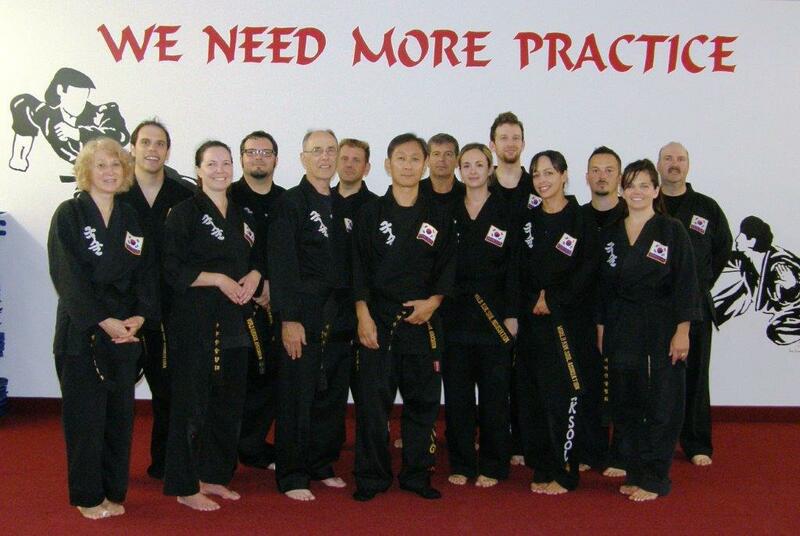 Thank you Instructors and Students! Be proud of your accomplishments! 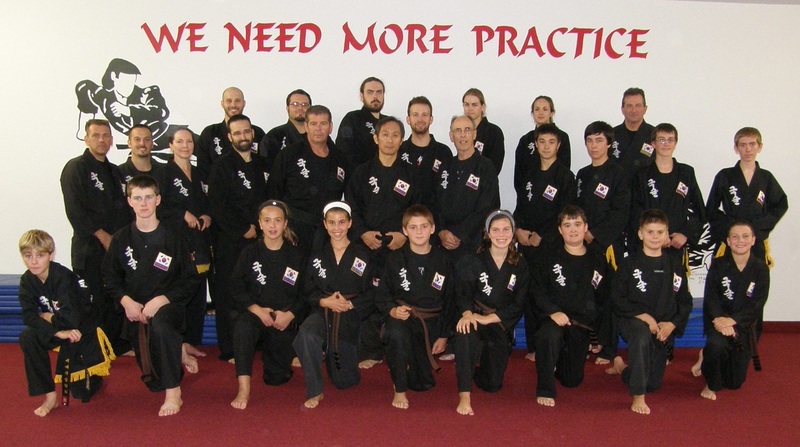 Saturday training for Brown Belt and higher ranks. 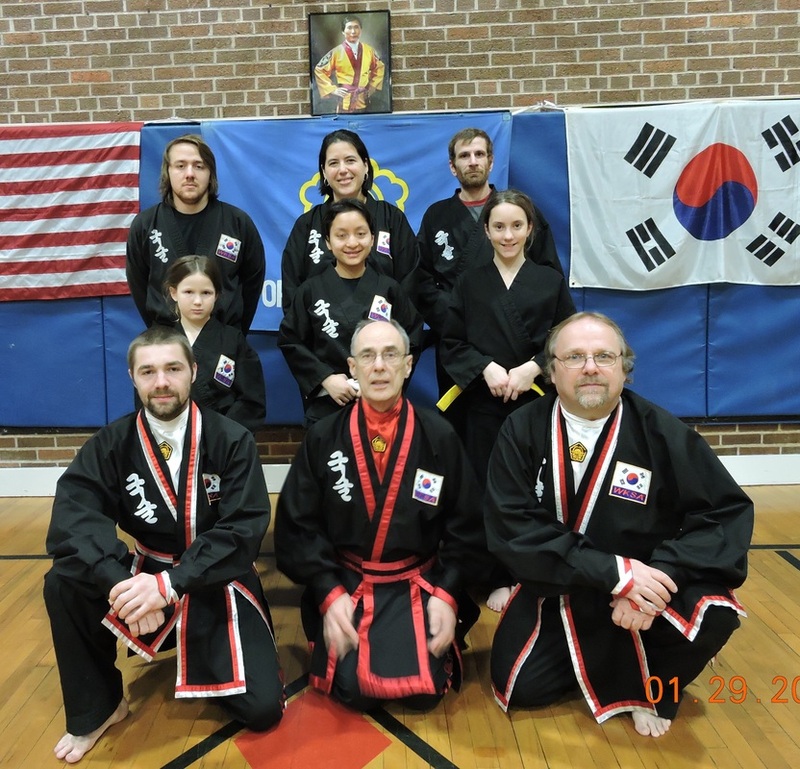 Sunday Training for 2nd degree and higher ranks. 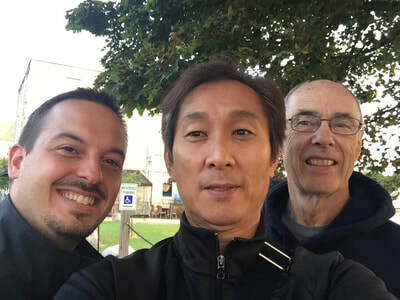 Our thanks to SSKJN Sung Jin Suh for traveling to Sault Ste. 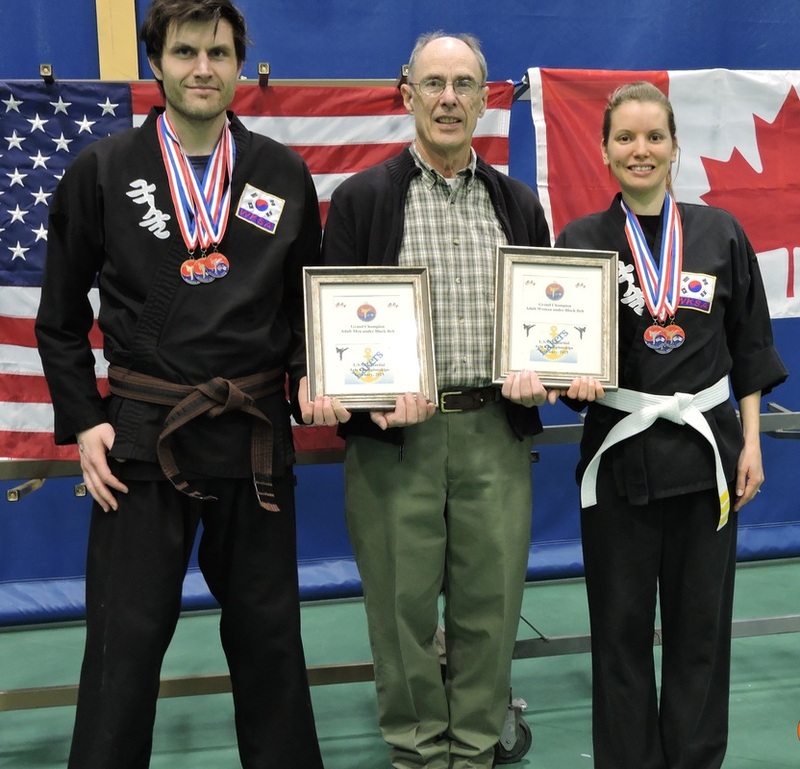 Marie, Ontario to train us and PKJN Kenneth for bringing him to and from the airport in Detroit. 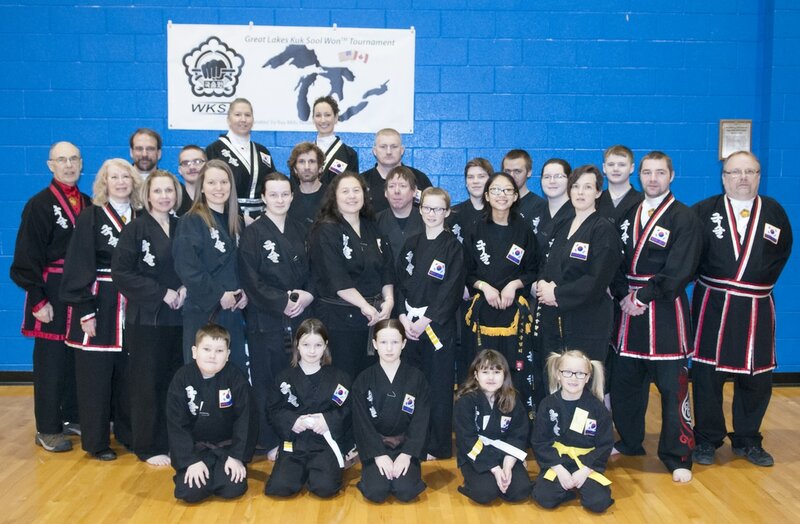 Instructors and students from the Kuk Sool Won schools in Sault Ste. 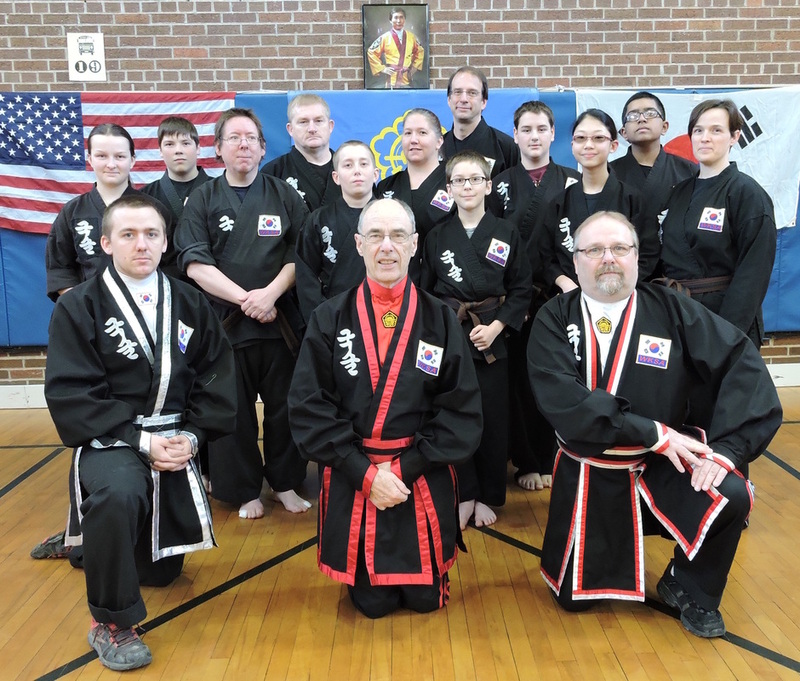 Marie, Michigan and Ontario received a special visit from the Grandmaster and three visiting Masters in the martial art style of Kuk Sool Won. 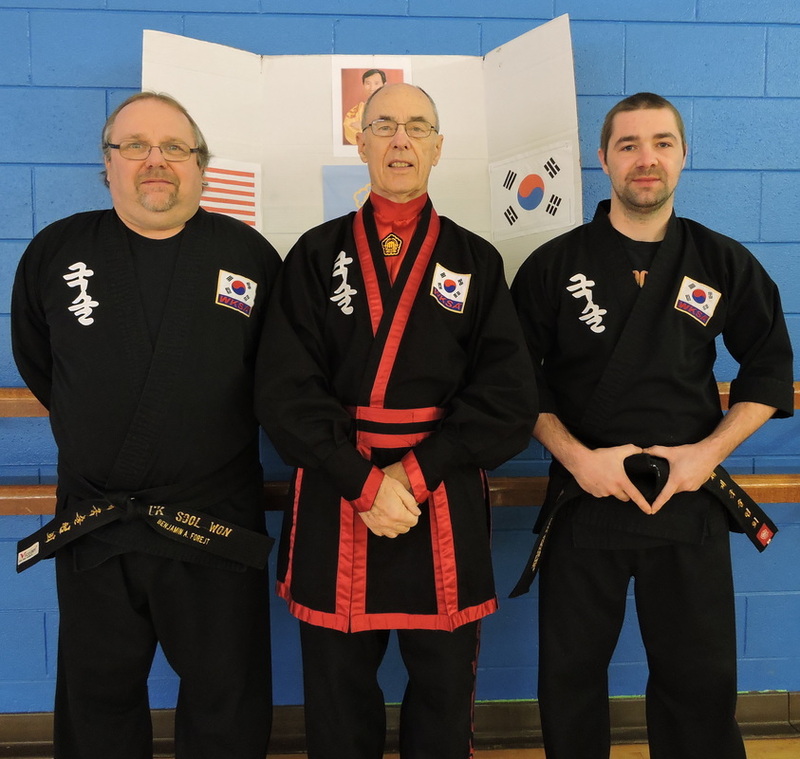 Grandmaster In Hyuck Suh 10th degree, Sung Jin Suh 9th degree, Alex Suh 8th degree and Master Song 7th degree conducted a testing for 1st degree and higher levels of Black Belts and then presented a training seminar. 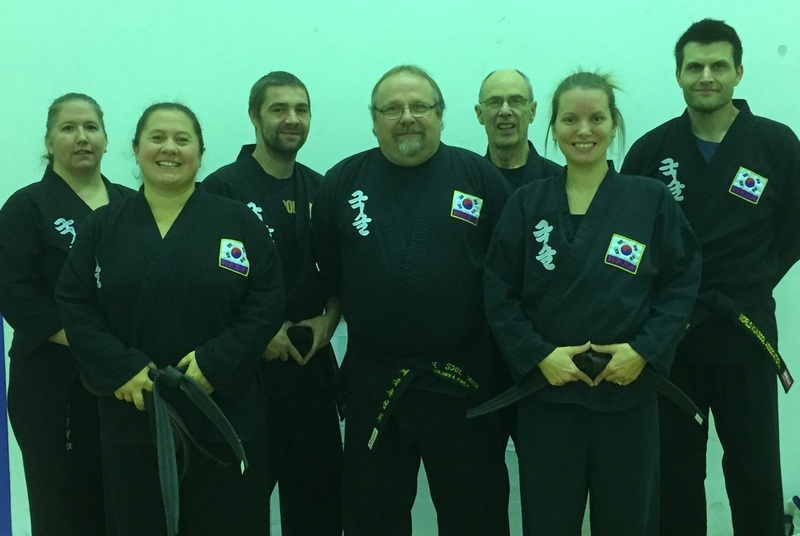 At the conclusion of the seminar Jon Daley was promoted the the rank of 1st degree Black Belt in the style of Kuk Sool Won. Nicely done Sa Bum Nim!! Be proud of your accomplishments! 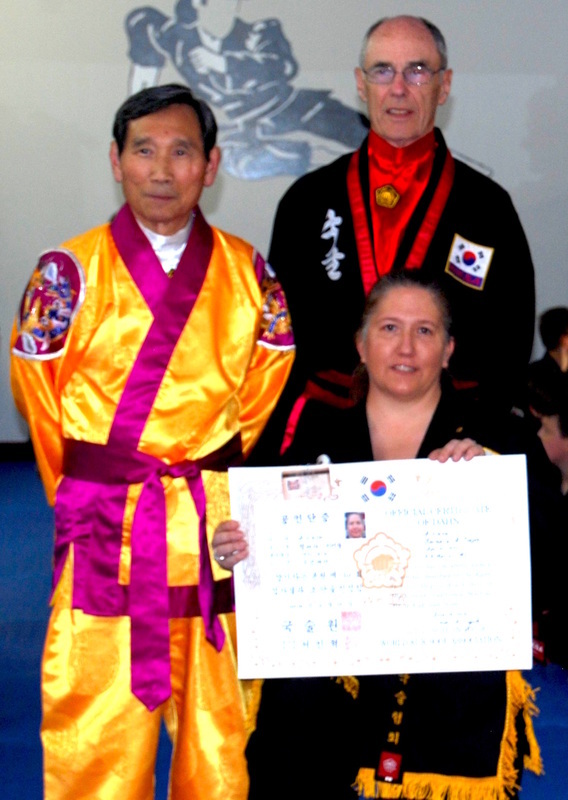 Michele Cole recently promoted to 1st Degree Black Belt in the Korean martial art style of Kuk Sool Won. 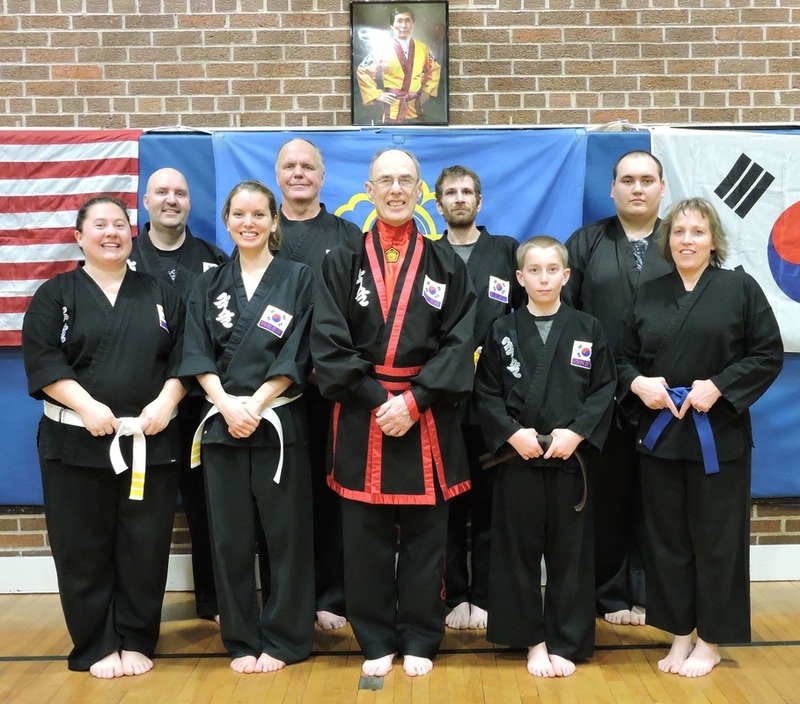 Congratulations on your promotion to Master level. JDKJN & JIKJN, Thank you Gentlemen for the training in running a tournament! I hope to be of more assistance to you in future tournaments. 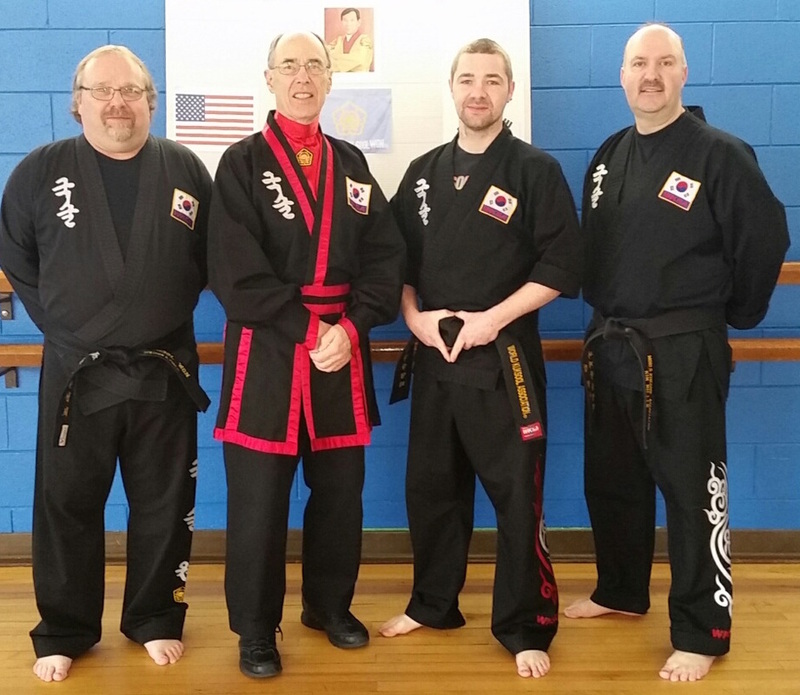 Sunday training with 2nd degree Black Belts and higher. 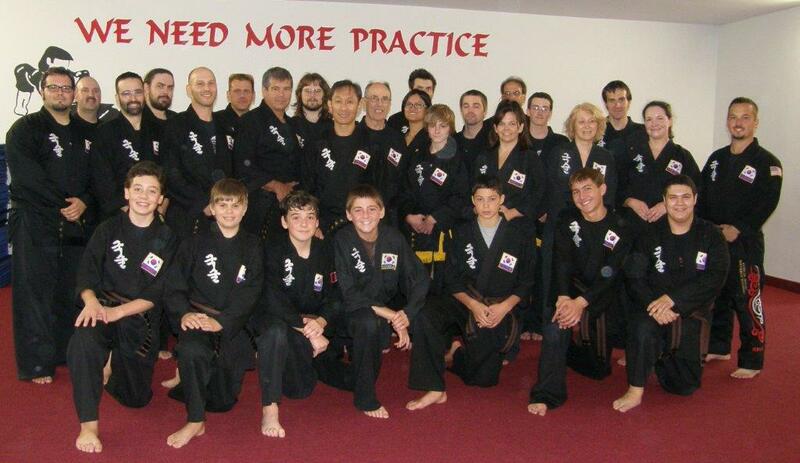 Saturday training with Brown belts, Dahn Bo Nim and all degrees of Black Belts. 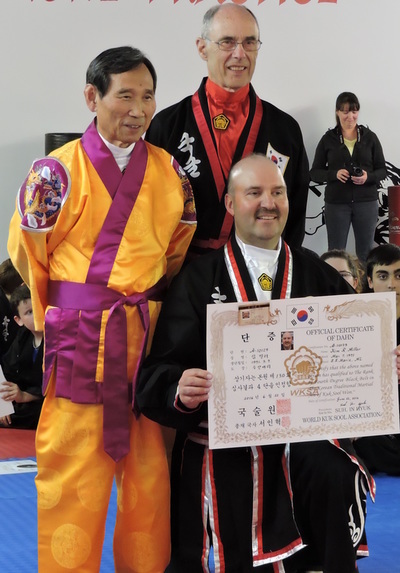 The Grandmaster of the Korean Martial Art of Kuk Sool Won presented a seminar at the Kuk Sool Won Family Martial Art Center in Sault Set. Marie, Ontario, Canada on Wednesday, June 22, 2016. 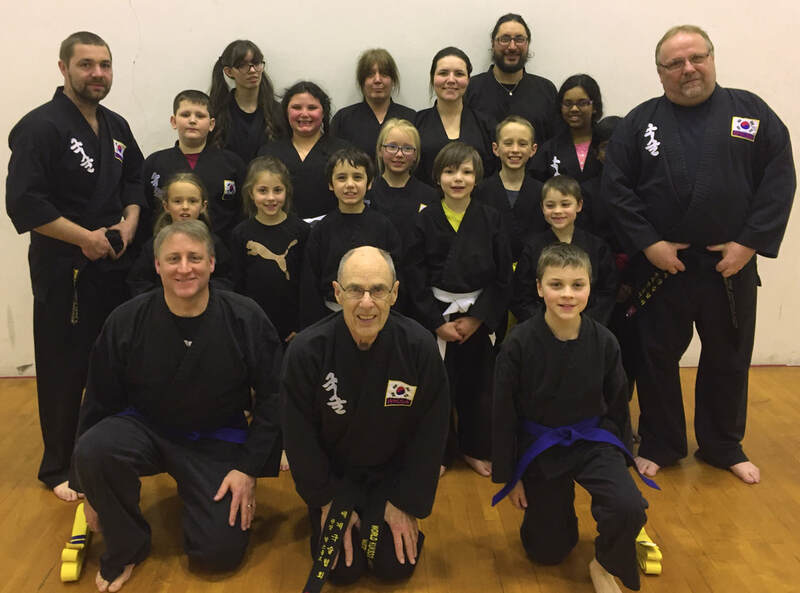 Instructors and students from the local Kuk Sool Won group who train at Washington Elementary School and in the Norris Center on the LSSU campus attended the Black Belt testing before the seminar and the seminar that followed. 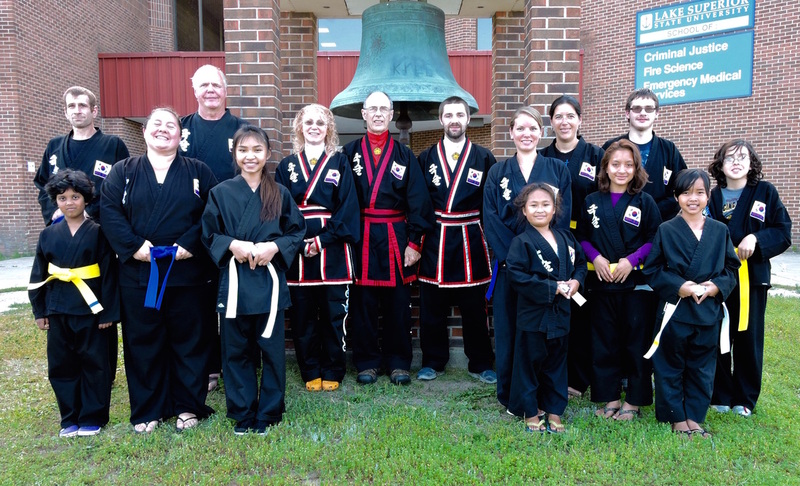 At the conclusion of the Seminar five students from Sault Ste. 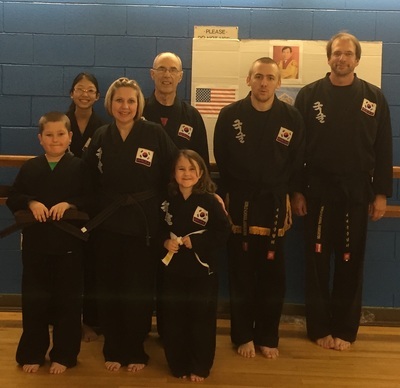 Marie, Michigan were promoted to the rank of 1st degree Black Belt. 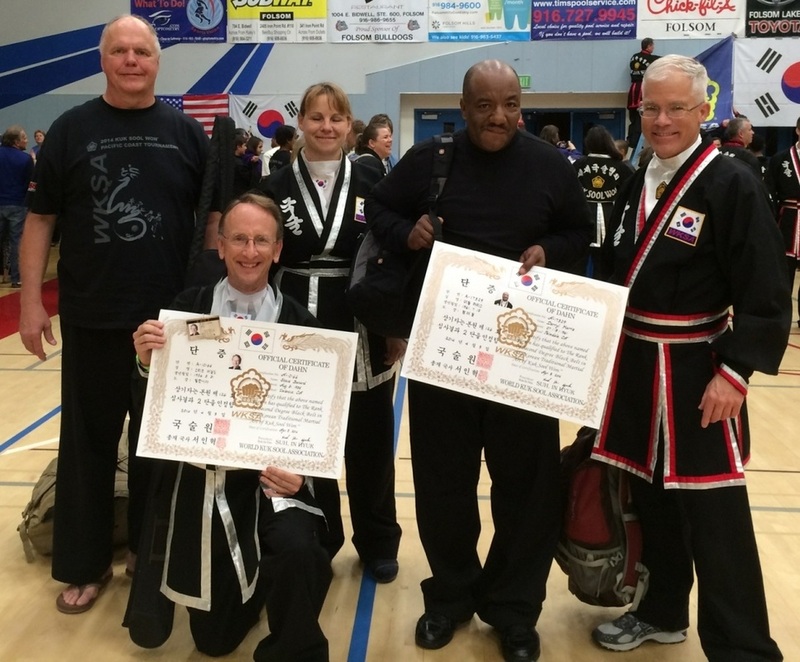 One student, Kim Miller, received his promotion to the rank of 4th degree Black Belt. 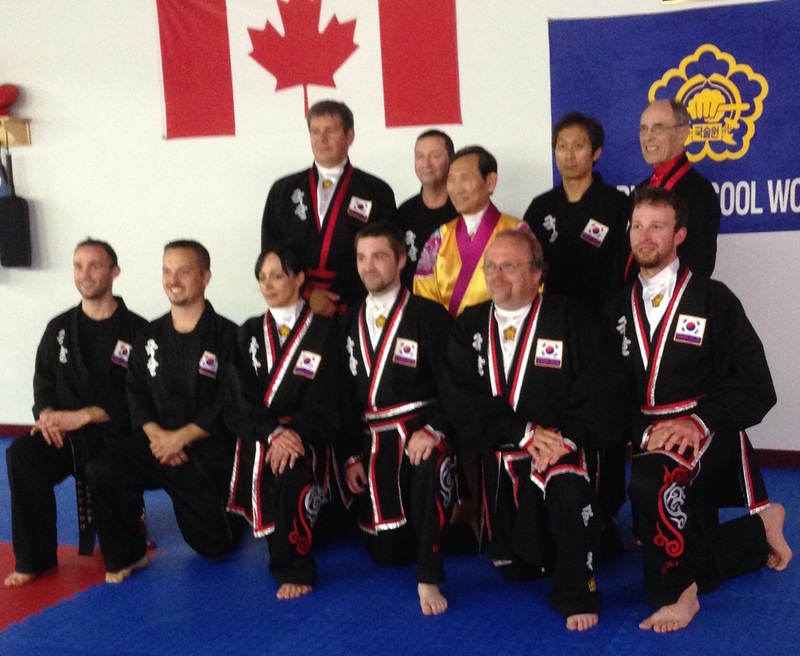 Thank you for attending and Congratulations to all who promoted. Be proud! 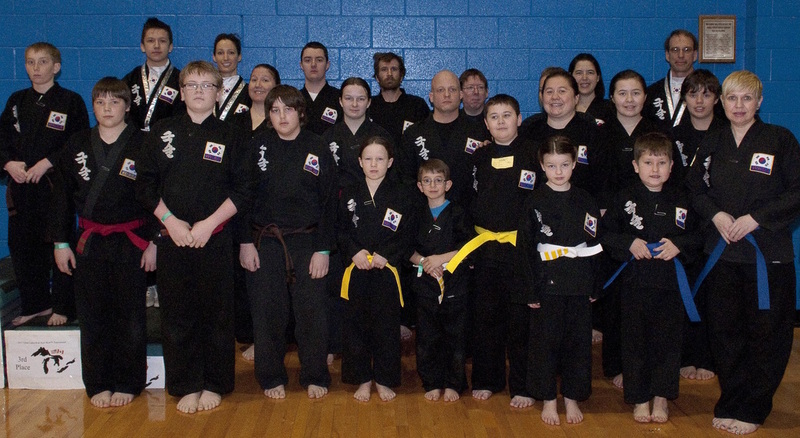 Students & Instructors from the Kuk Sool Won Schools in Sault Ste. 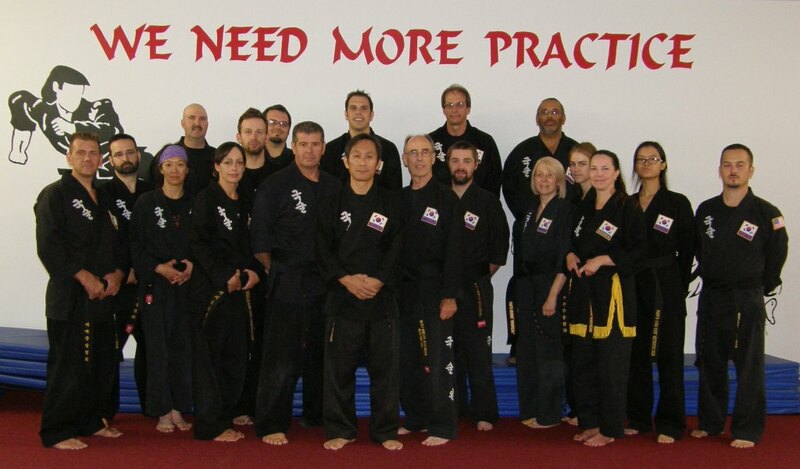 Marie, Michigan & Sault Ste Marie, Ontario enjoyed the Seminar provided by Grandmaster Kuk Sa Nim and the Seminar Team. 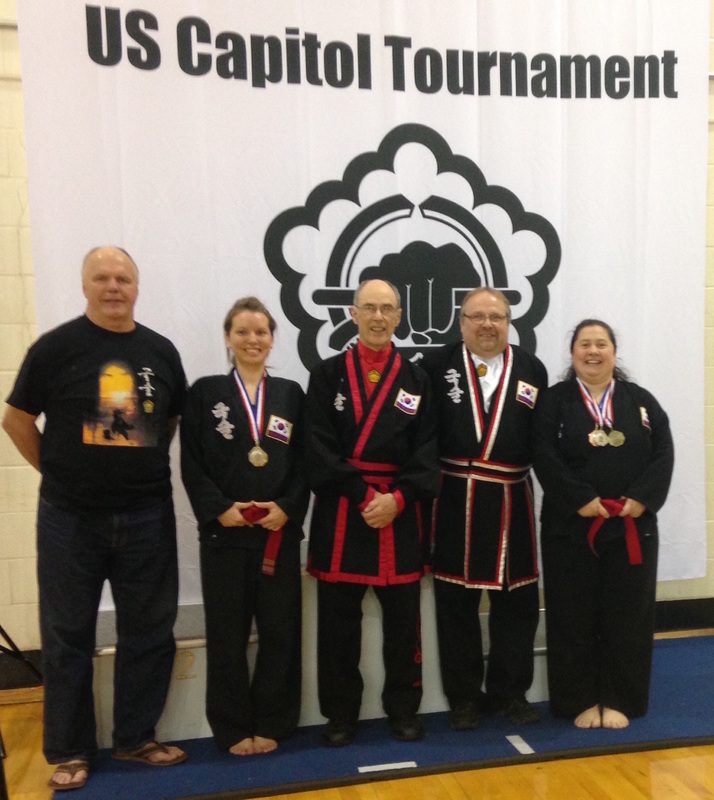 On Saturday, April 23 Kuk Sool Won martial arts instructors Karl Stolt & Ben Forejt traveled to Washington D.C. for the 1st US Capitol Tournament with three of their students, Scott Gilbertson, Cindy Gardner and Katie Clow. 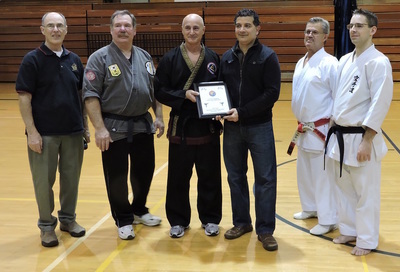 The instructors helped with the judging. 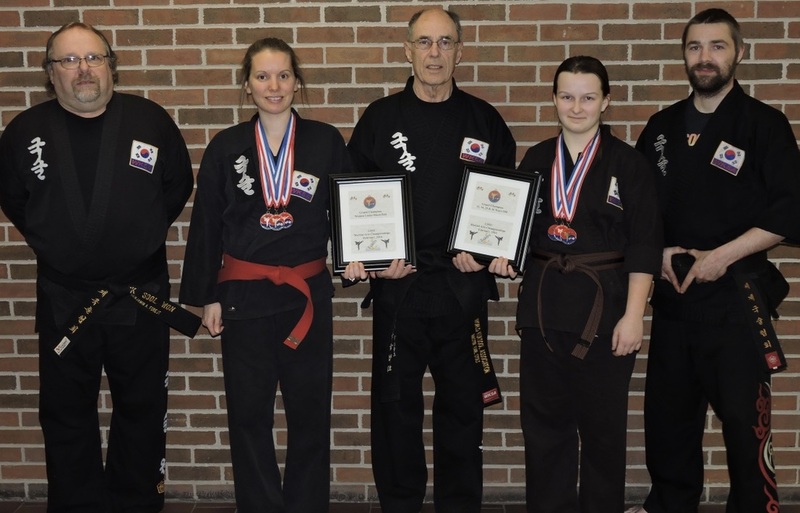 The students competed and they all medaled. 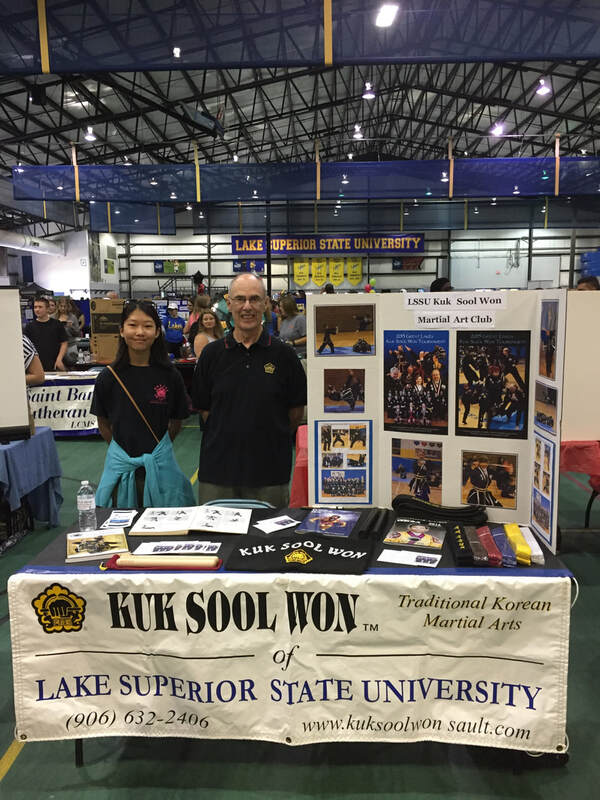 The World Kuk Sool Association April tournament is scheduled to be held in the Norris Center on the LSSU Campus in 2017. 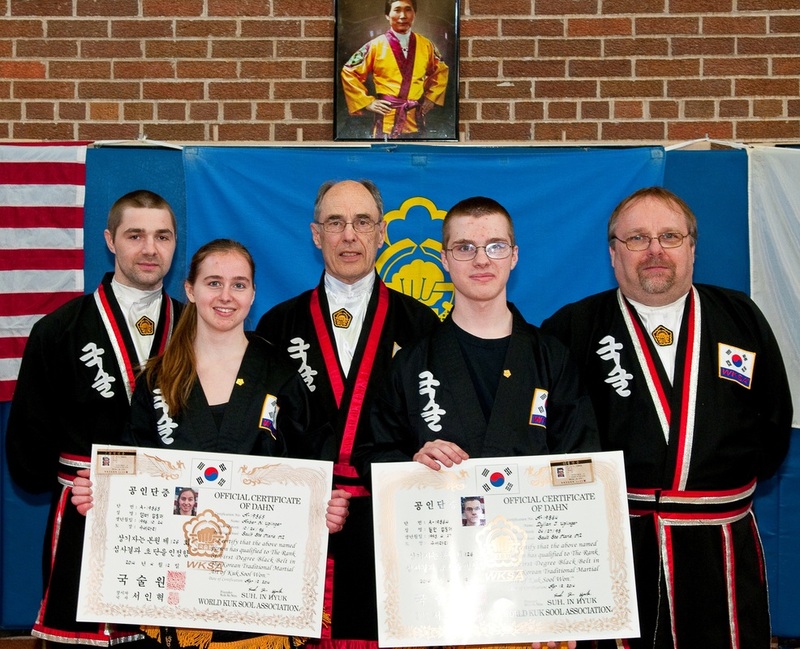 The photo shows from left to right: SBN Ben Forejt, Cindy Gardner, JIKJN Karl Stolt, Faith Cole, SBN Ben Forejt II. Cindy Gardner received the Grand Champion Award for earning more points in the three areas of competition than all the other adult ladies. 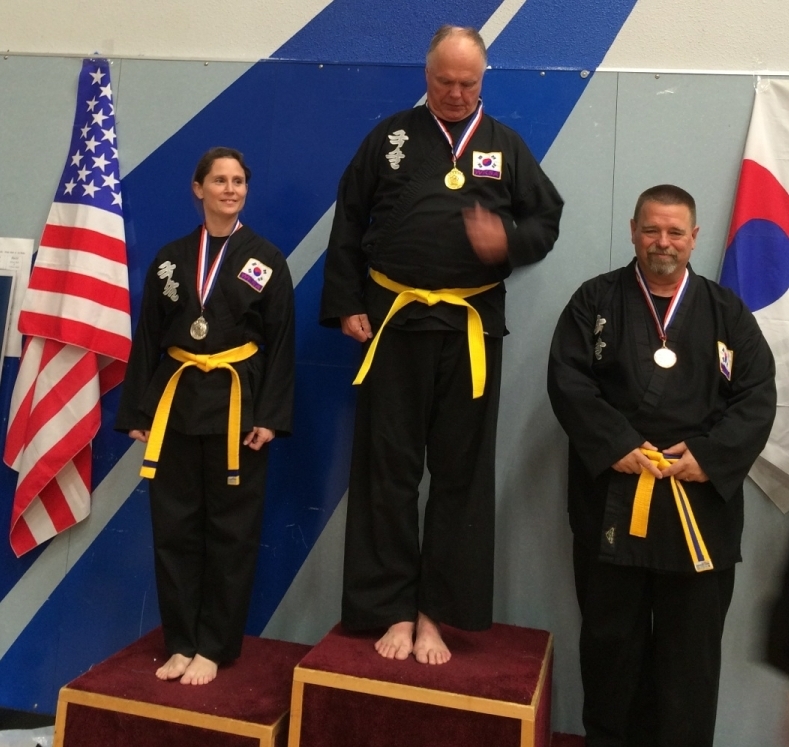 Faith Cole earned the most points in the 13 to 16 age group. 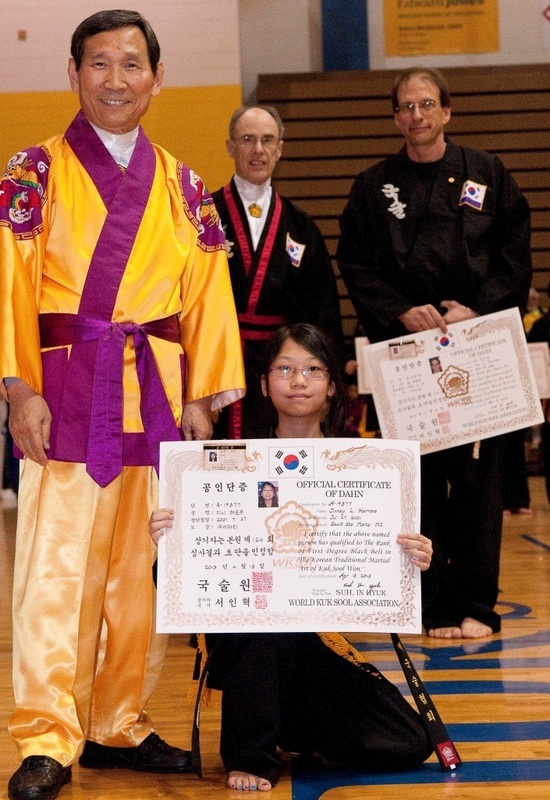 The three competitions were empty-hand forms where they perform a memorized routine by themselves. 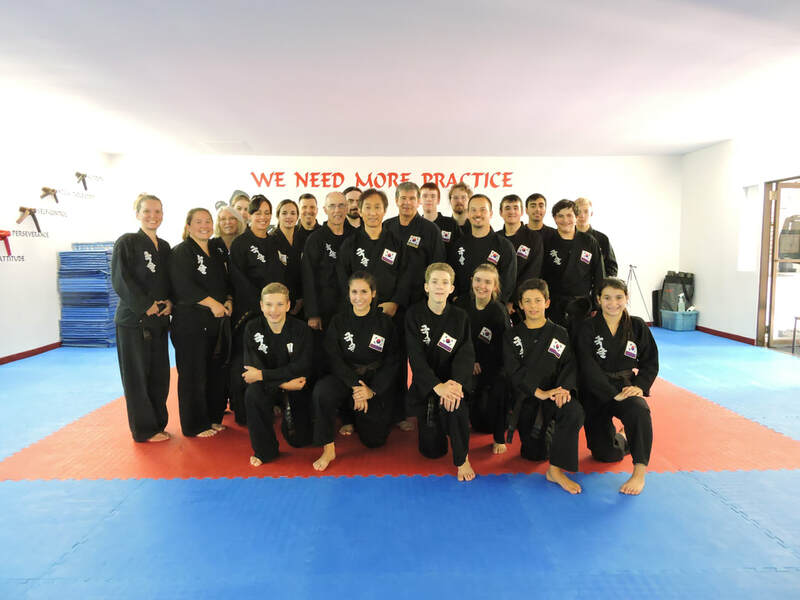 Second, self-defense where they use three different techniques to defend against an attacker. Third, sparring, a controlled touch fighting match. Thank you!! 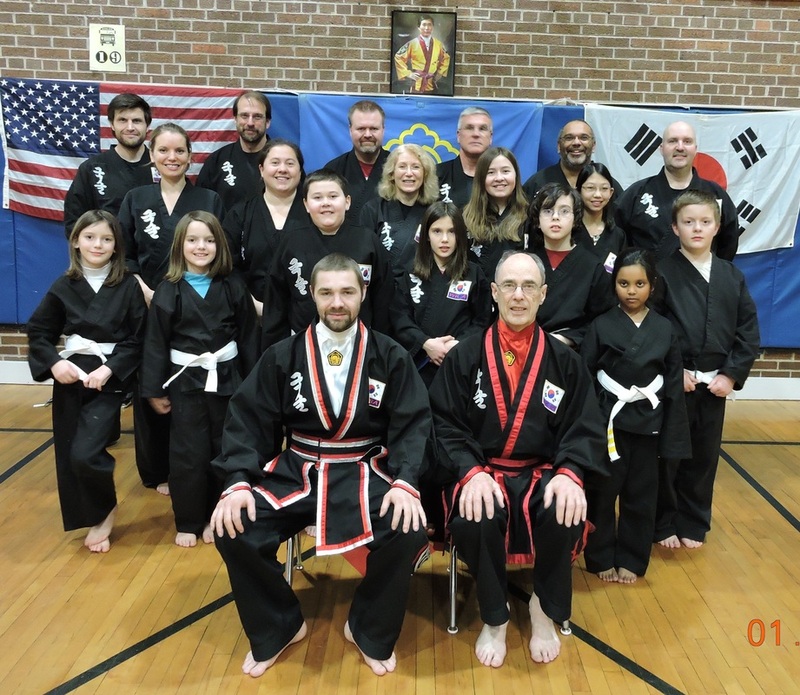 Black belts, Volunteers, Competitors & their Groupies. 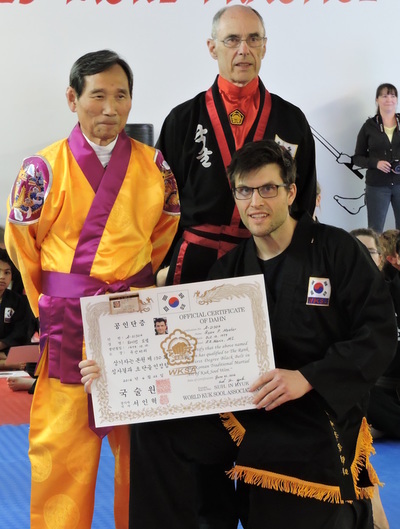 At the conclusion of a Seminar conducted by Kuk Sa Nim, the Grandmaster of the martial art style of Kuk Sool Won, and visiting masters, Corbin McConnell completed his journey to the level of 1st degree Black Belt in the Korean martial art style of Kuk Sool Won. 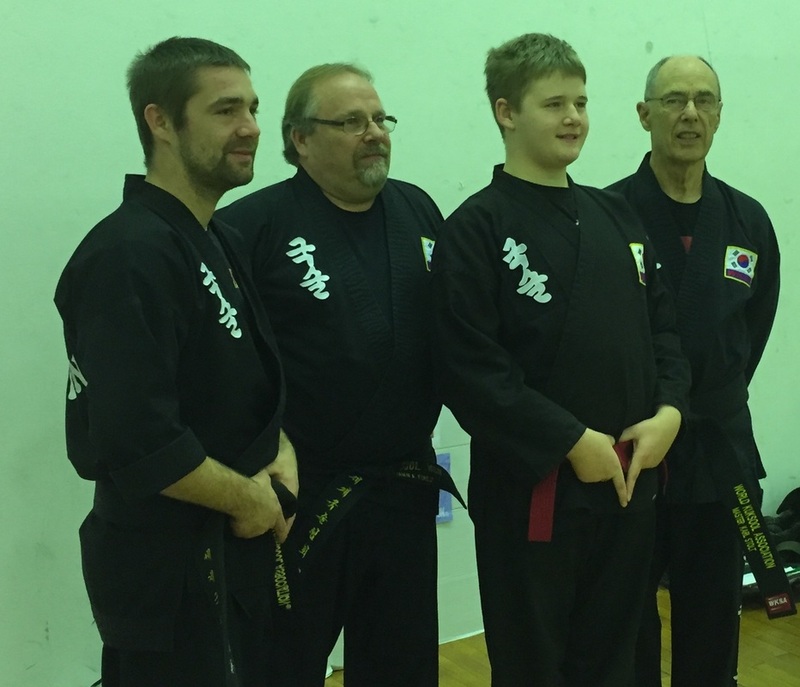 The Testing and Seminar were held in Sault Ste. Marie, Ontario on June 17, 2015. Jo Kyo Nim Corbin McConnell, a junior in the Sault Area Public Schools,, tested quarterly during the last two years, sometimes before the Grandmaster & visiting masters, and often before his local instructors. 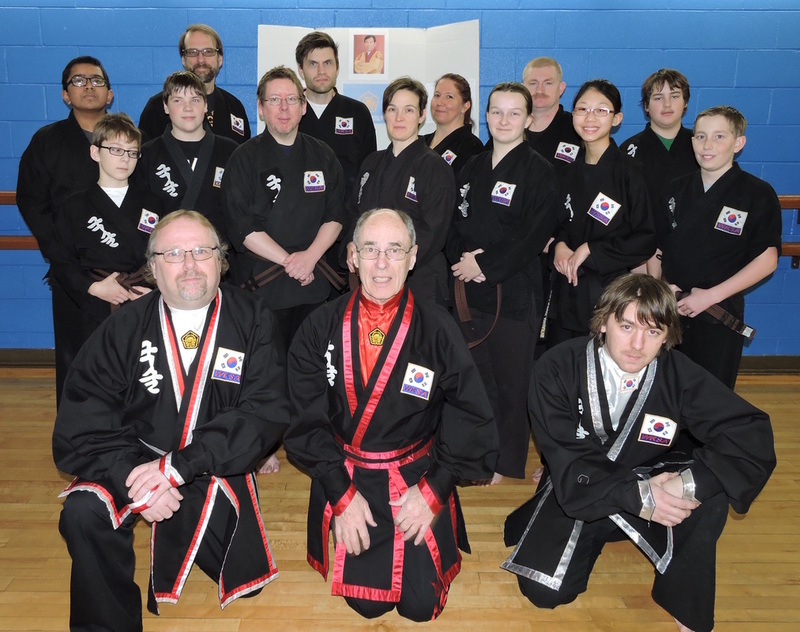 The tests involve a considerable amount of memory and physical endurance. 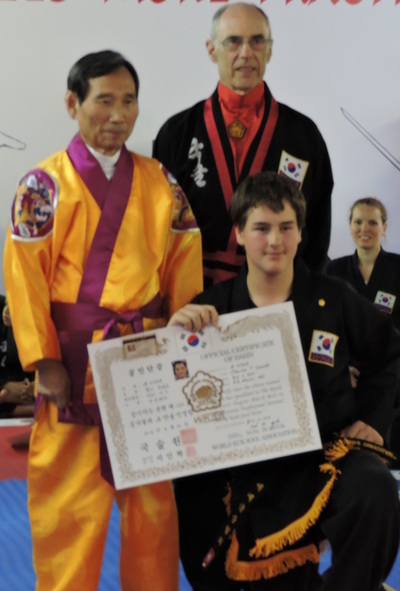 This advancement in rank in the martial art style of Kuk Sool Won™ is most definitely an accomplishment of which he may be extremely proud. 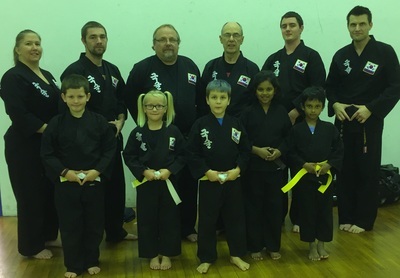 All of the students train at Washington Elementary School with instructors Karl Stolt, Benjamin A. Forejt, Benjamin A. Forejt II, Kim Miller & Dylan Floyd. 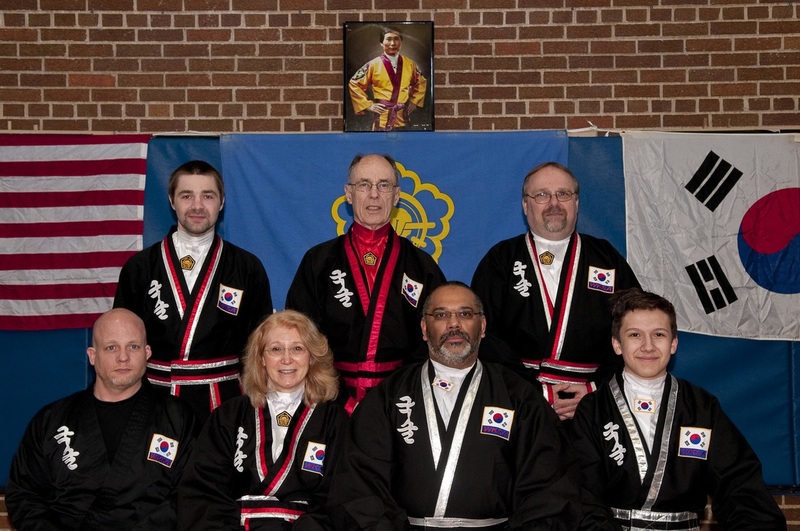 Back row left to right, SBN Ben Forejt II, JIKJN Karl Stolt, SBN Ben Forejt Front row left to right, JKN Adam Mohagen, SBN Lynn Wicks, KSN Dr. Chris Hall, KSN Austin Teeple. 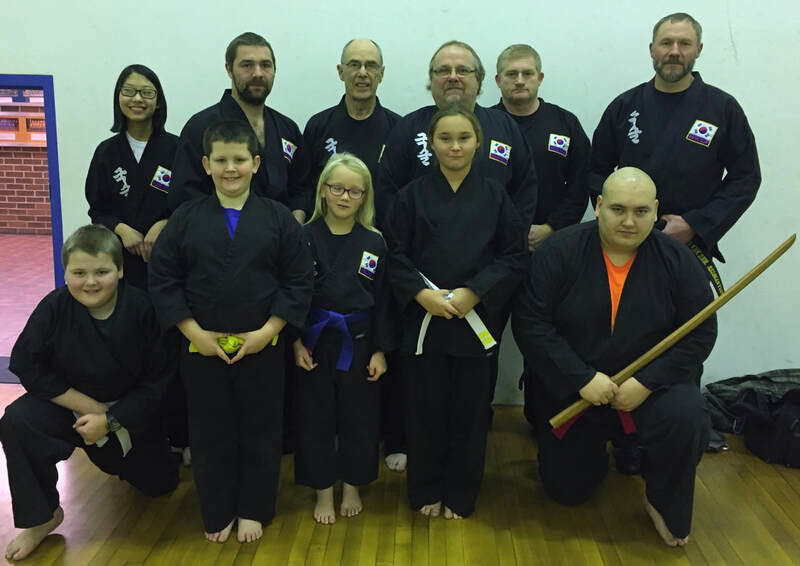 The LSSU Kuk Sool Won Martial Art Club held a tournament in the Student Activity Center on February 7th 2015. Points are awarded for 1st, 2nd, 3rd & 4th places. 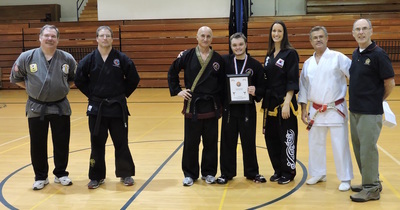 Ryan Mosher earned the most points of any adult male and Cynthia Gardner earned the most points of any adult female. 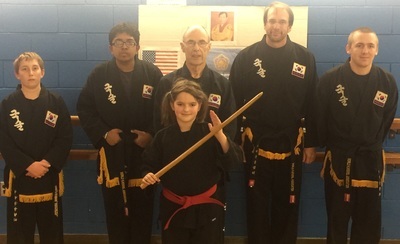 Ryan and Cynthia train in the Korean Martial Art of Kuk Sool Won at Washington Elementary School. 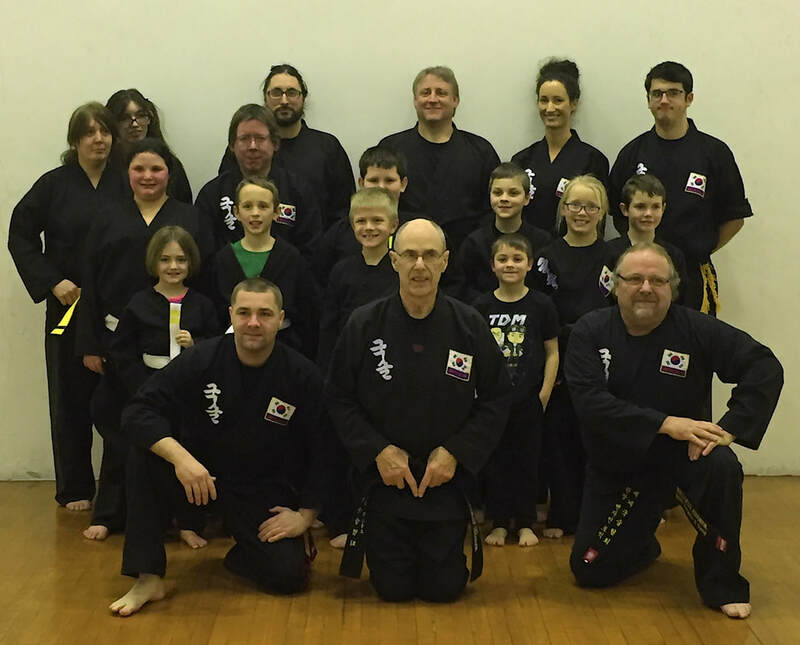 January 2015 marks the end of another session. 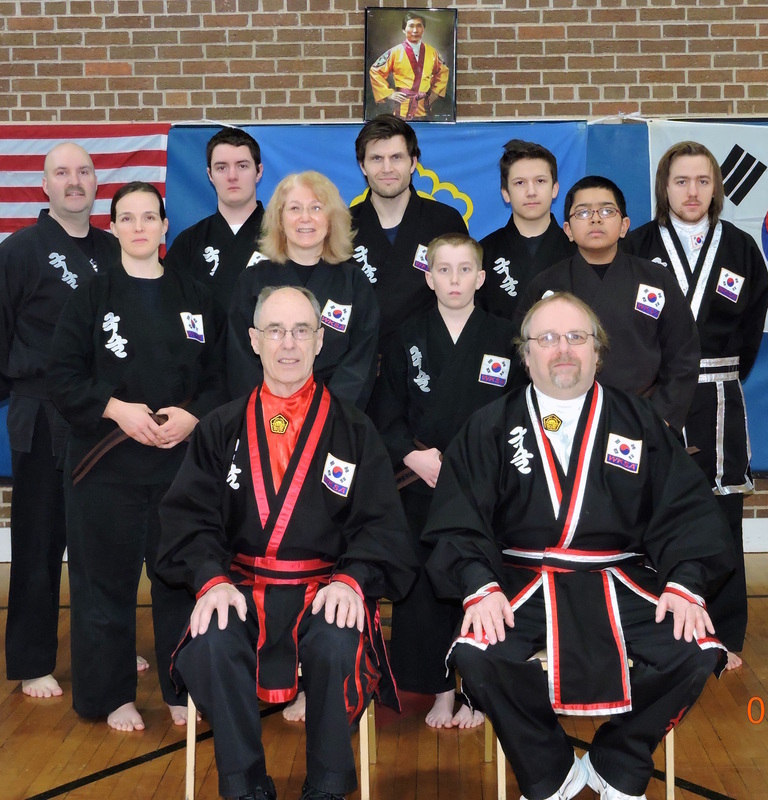 Here are the promotion photos. Saturday, October 18th and Saturday, October 25th were the two opportunities for our students to complete the 4th quarter testing for 2014. 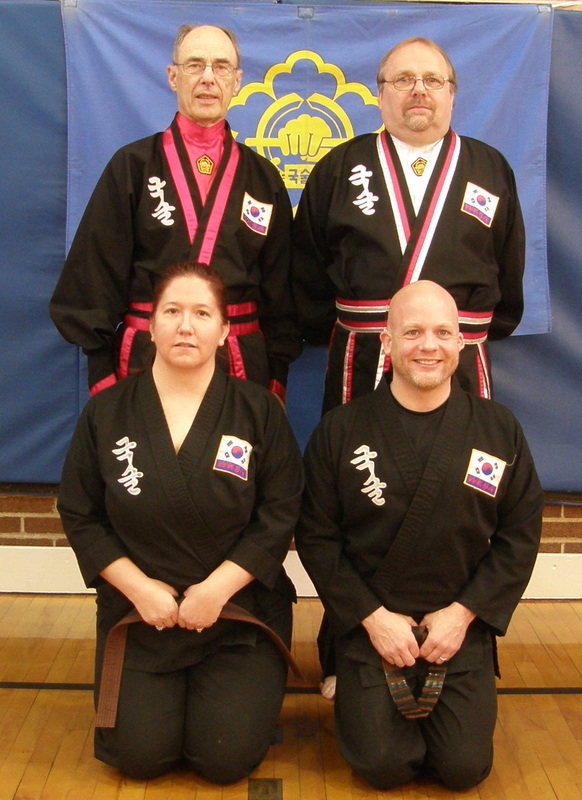 DBN Barbara Teeple and DBN Adam Mohagen attended on the 18th and did a fine job. 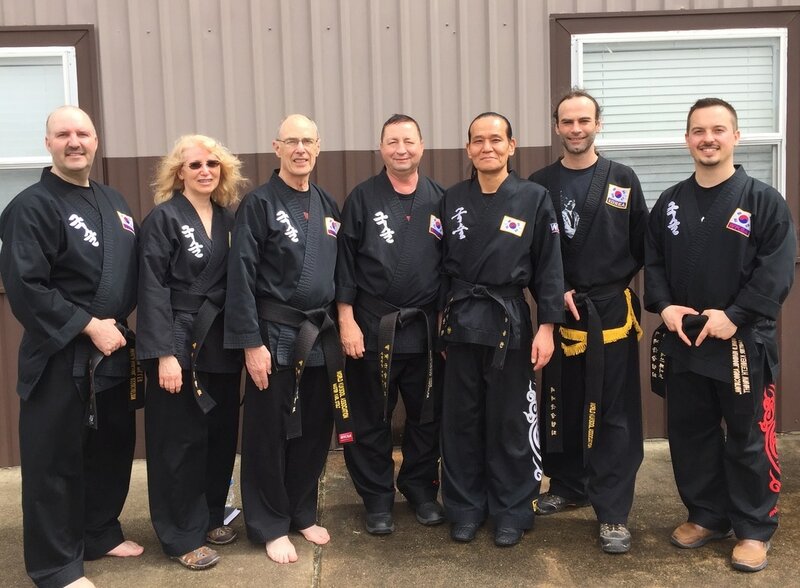 In the right hand photo, from left to right, DBN Wyatt Landreville, DBN Corbin McConnell, PSBN Lynn Wicks, JKN Dr. Chris Hall, JKN Austin Teeple & DBN Ryan Mosher stand behind instructors SBN Ben Forejt and JIKJN Karl Stolt. 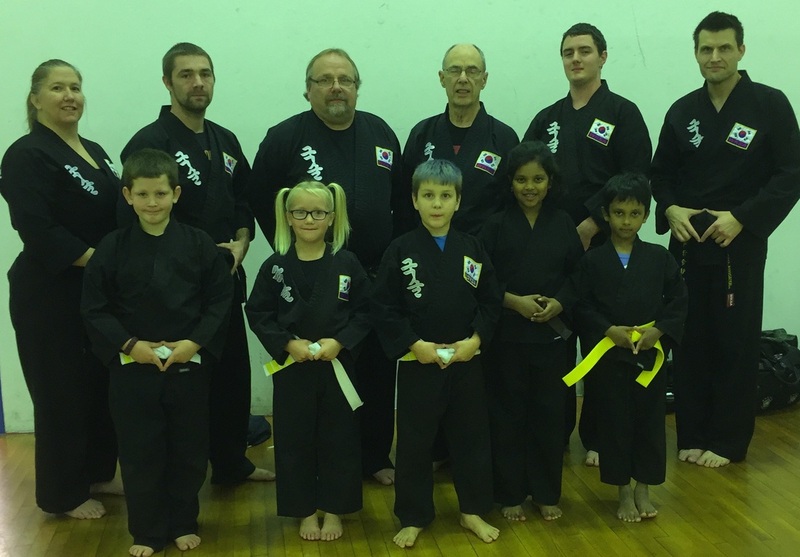 This group attended on the 25th and they too can be proud of their performance. 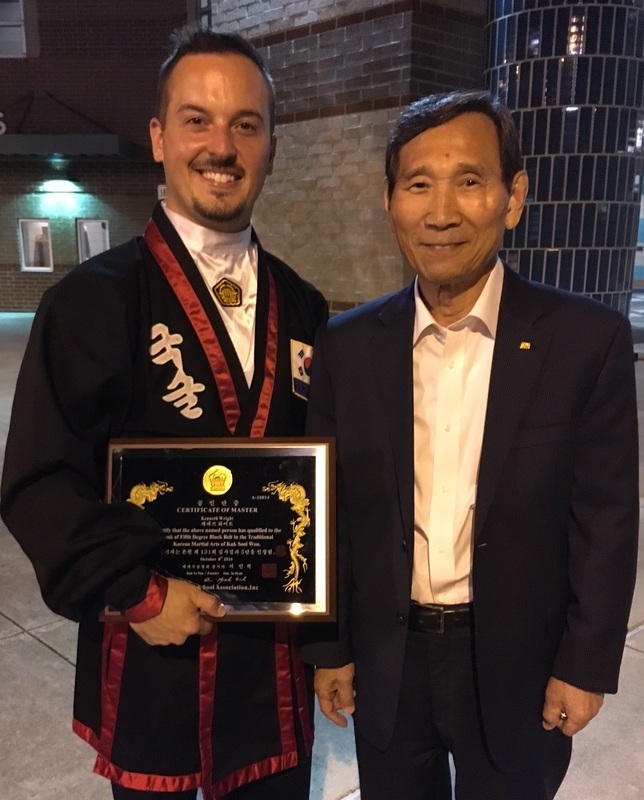 Local martial art student Karl Stolt recently traveled to Houston, Texas to attend the 2014 WKSA Kuk Sool Won™ World Championship. 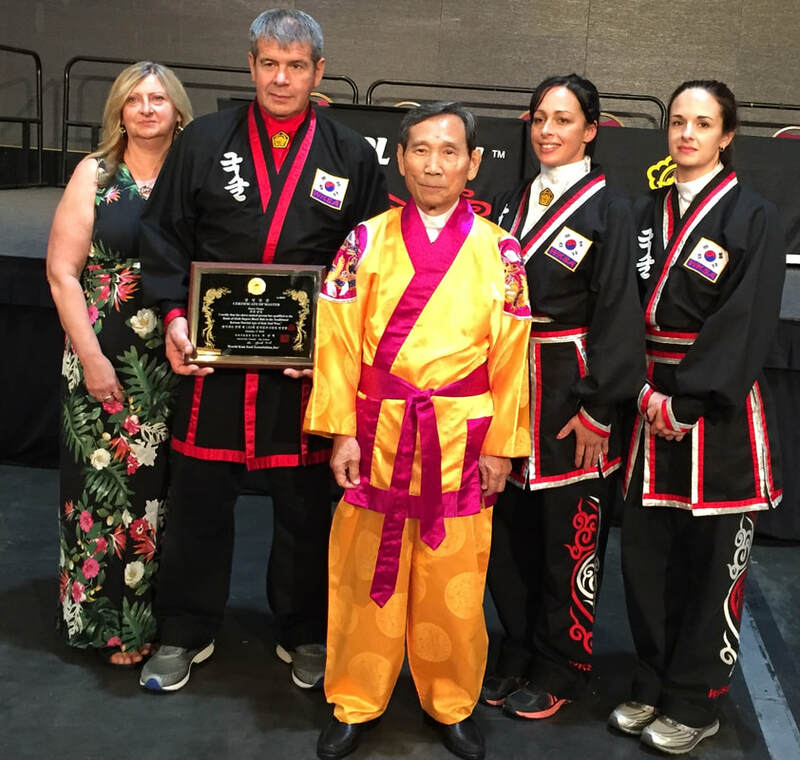 The tournament commemorated the 40th anniversary of Grandmaster Kuk Sa Nim bringing the martial art of Kuk Sool Won™ to the United States. 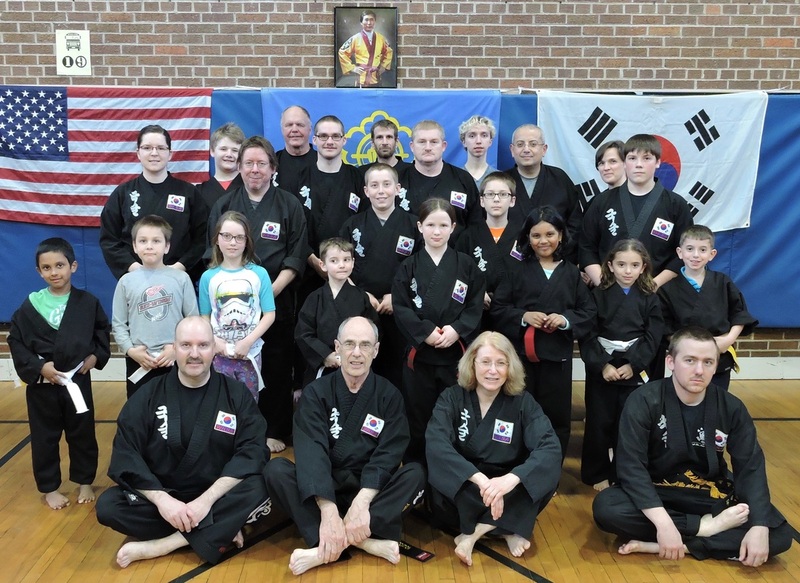 The 900+ competitors came mostly from throughout the United States from coast to coast; however, England, Canada and Korea were also represented. Karl Stolt was honored with a promotion to Sixth Degree Black Belt along with six of his classmates from the United States and England. 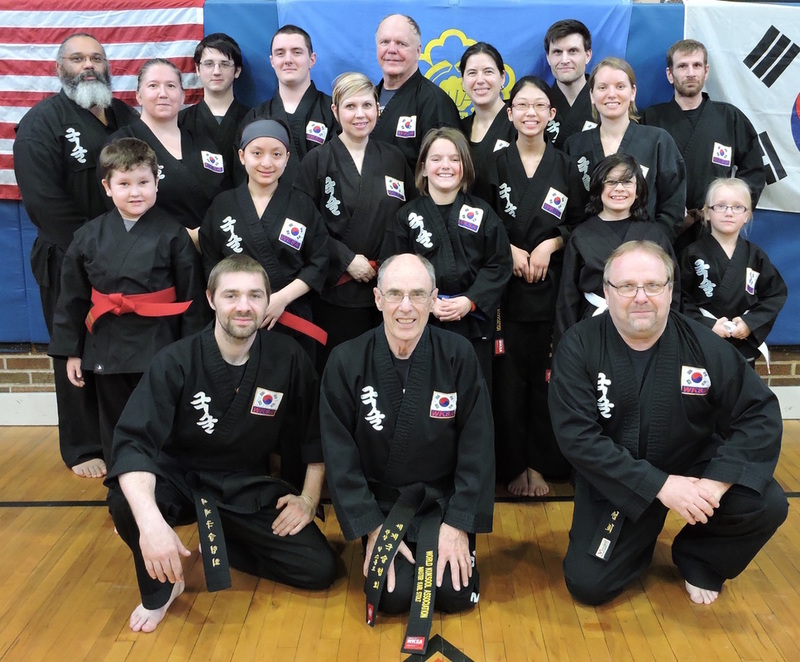 After the promotion ceremony, the new Sixth Degree Masters took part in the demonstration. 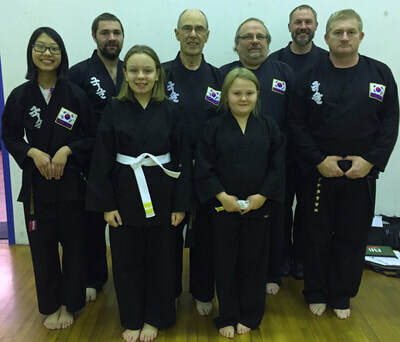 Also included in the demonstration was the Children’s Demo Team from Korea. 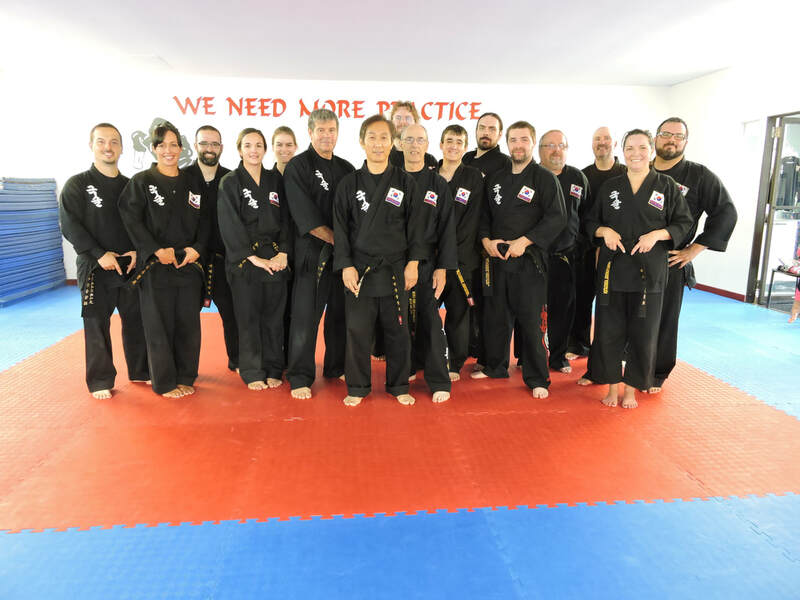 Master SSKJN Sung Jin Suh traveled to Michigan on September 12th to offer Black Belt training to the Kuk Sool Won schools in lower Michigan and Ohio. No photo. He then traveled the Sault Ste. 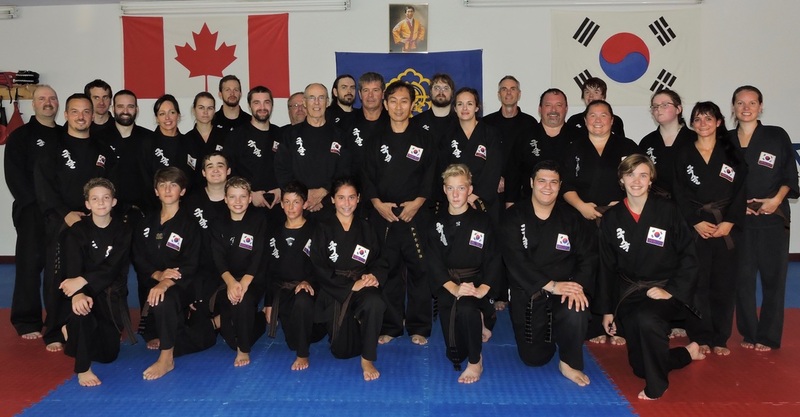 Marie, Ontario where he offered Black Belt training to the Kuk Sool Won schools from Sault Ste. Marie, Ontario and Sault Ste. Marie, Michigan on September 13th. Photo above. 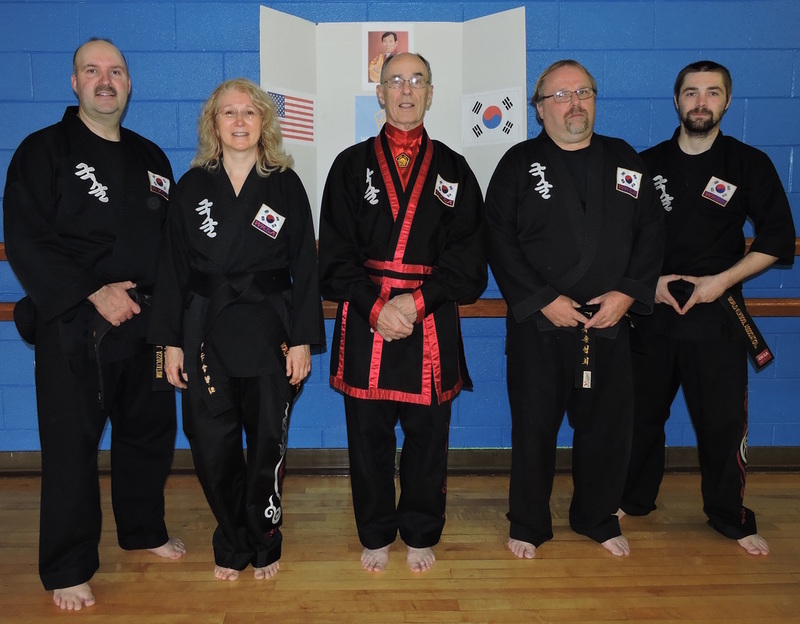 Second degree black belts and higher rank black belts received further training on September 14th. Photo above. 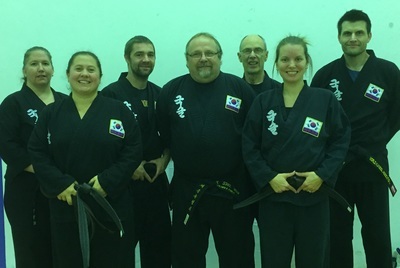 Everyone enjoyed the training! 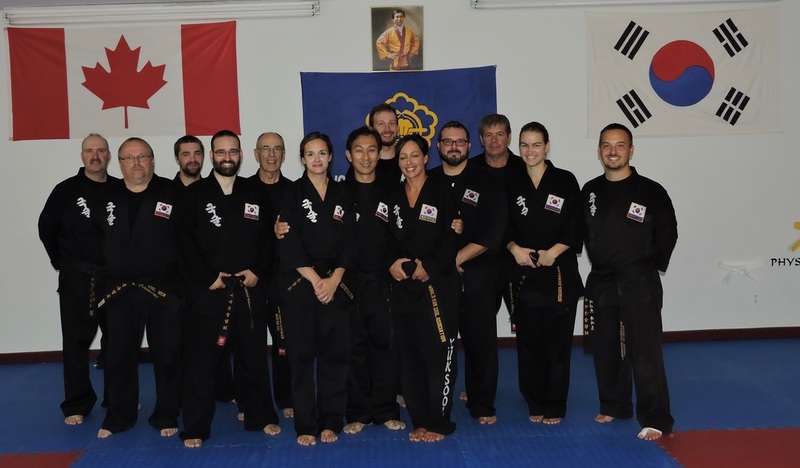 Thank you SSKJN Sung Jin Suh for taking the time and making the effort to give us this wonderful training! 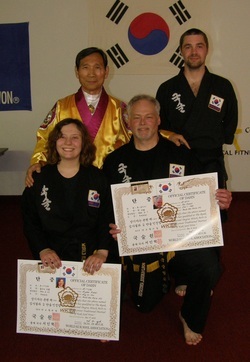 At the conclusion of a Seminar conducted by Kuk Sa Nim, the Grandmaster of the martial art style of Kuk Sool Won, and visiting masters, Rachel Reinke, Kori Cremeans and her daughter Kaya Beaudoin all completed their journey to the level of Black Belt in the Korean martial art style of Kuk Sool Won. 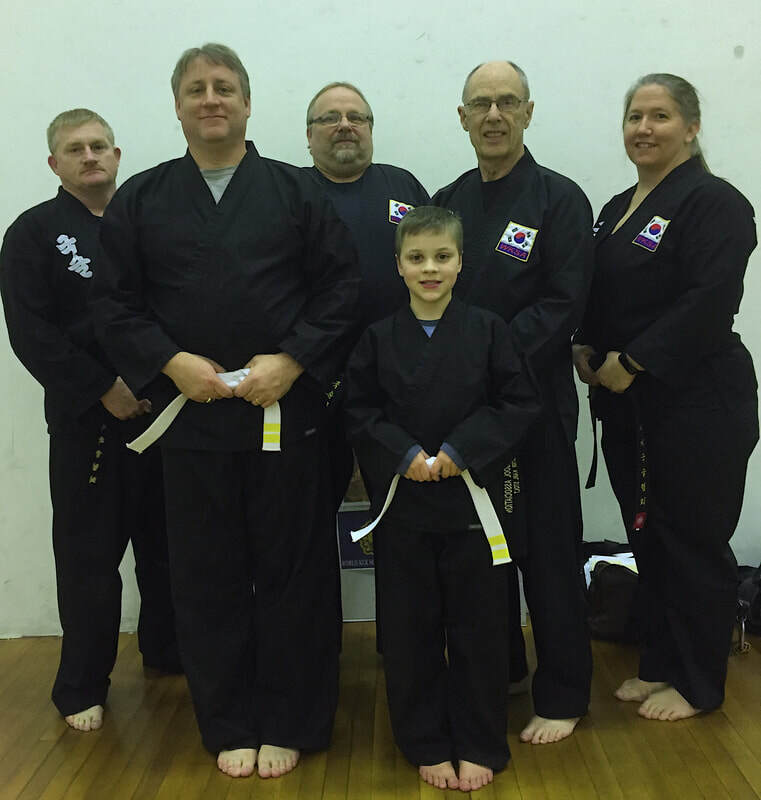 Dylan Floyd earned his promotion to 2nd Degree Black Belt. The Testing and Seminar was held in Sault Ste. Marie, Ontario on June 18, 2014. Students who train in Sault Ste. Marie, Ontario, and Sault Ste. 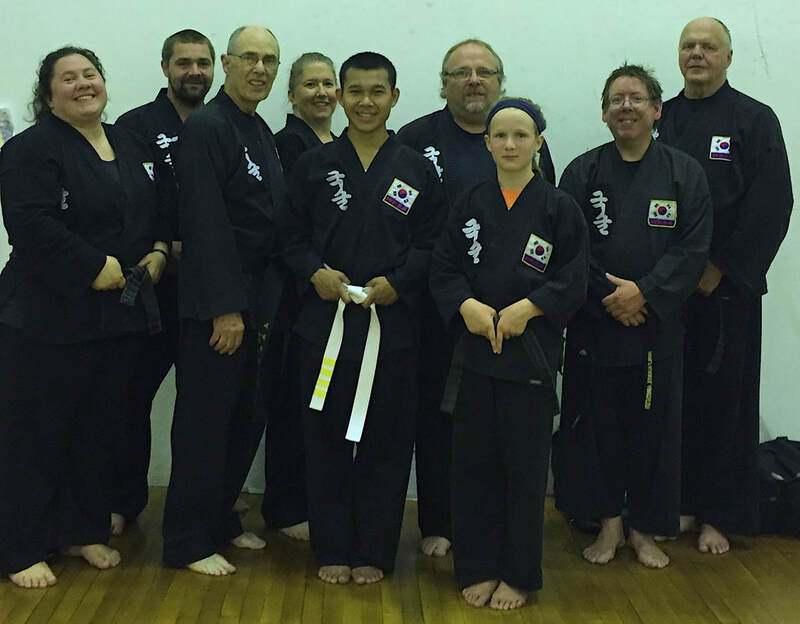 Marie, Michigan, joined together to enjoy the seminar. 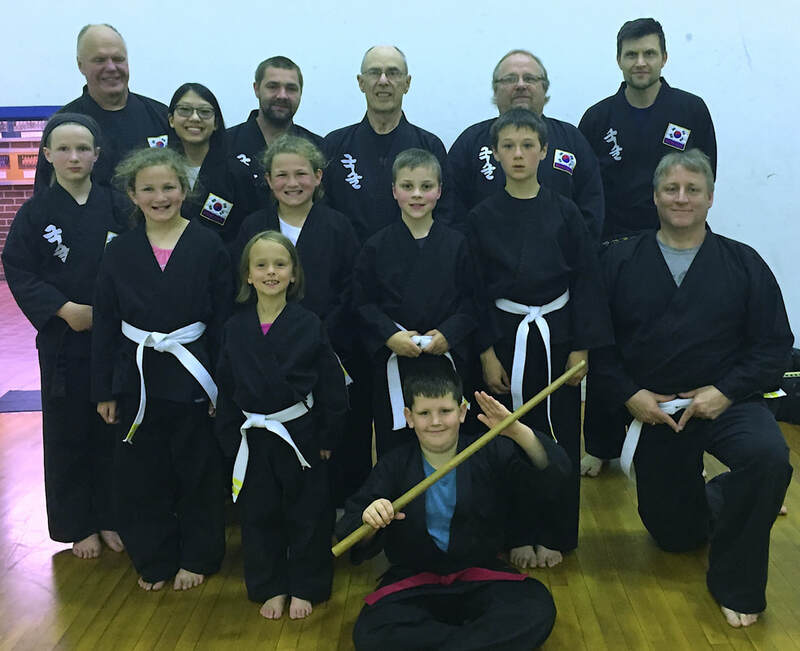 All of the students train at Washington Elementary School with instructors Karl Stolt, Benjamin A. Forejt, and Benjamin A. Forejt II. 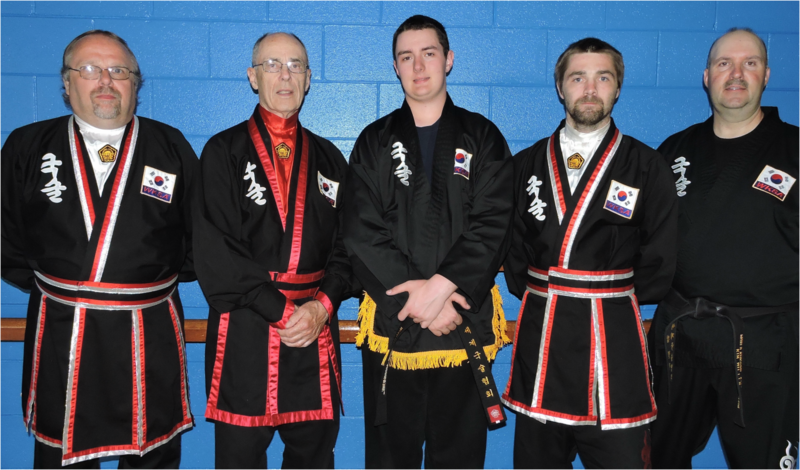 Scott Gilbertson is a yellow belt in the Kuk Sool Won School of Sault Ste. Marie, Michigan. While on temporary duty at Fort Irwin, CA SBN Antony Kinzell offered Scott the opportunity to train with him at his dojang in Palmdale, CA. 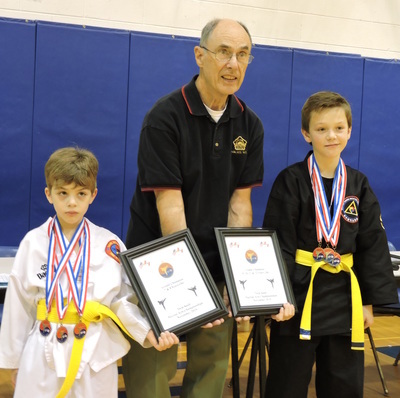 Scott had the good fortune of winning a gold medal in forms and a gold medal in sparring. 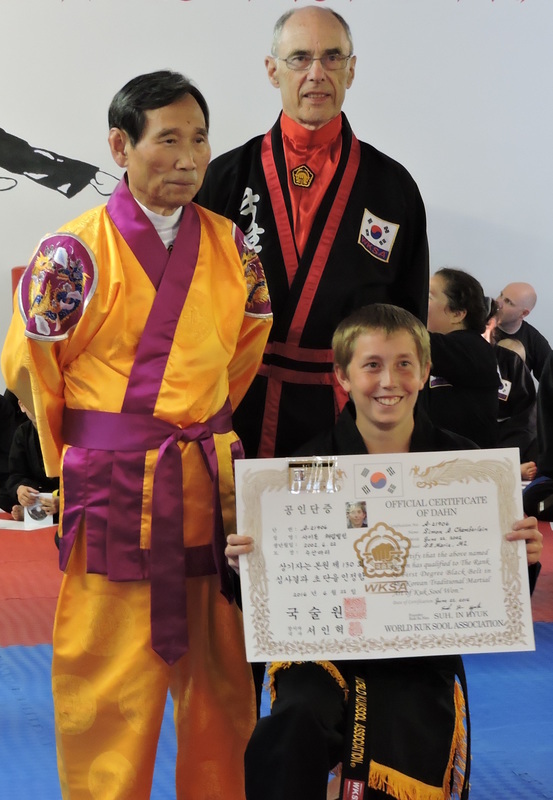 Thank you SBN Antony Kinzell for graciously allowing Scott to train with you and making it possible for him to attend the 2014 Pacific Coast Kuk Sool Won Tournament. You have provided him with lifelong memories. 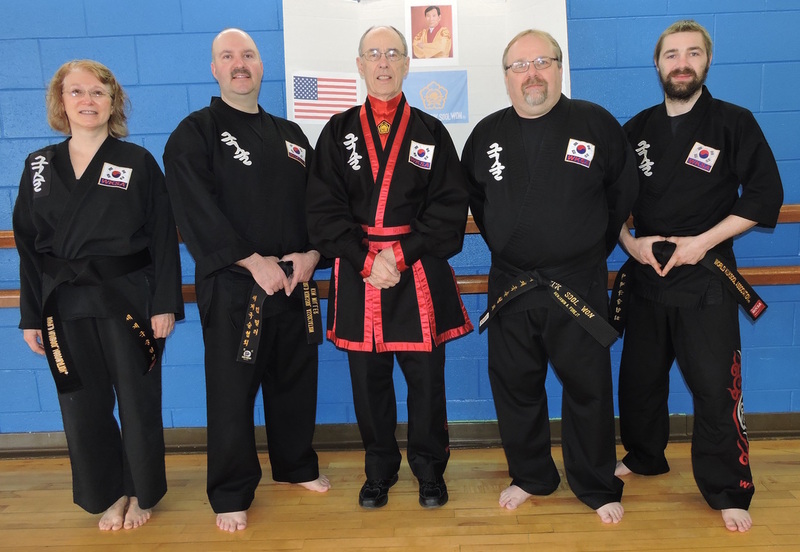 Newly promoted first degree black belts JKN Amber Uplinger and JKN Dyllan Uplinger with PKJN Karl Stolt and instructors SBN Ben Forejt II and SBN Ben Forejt. 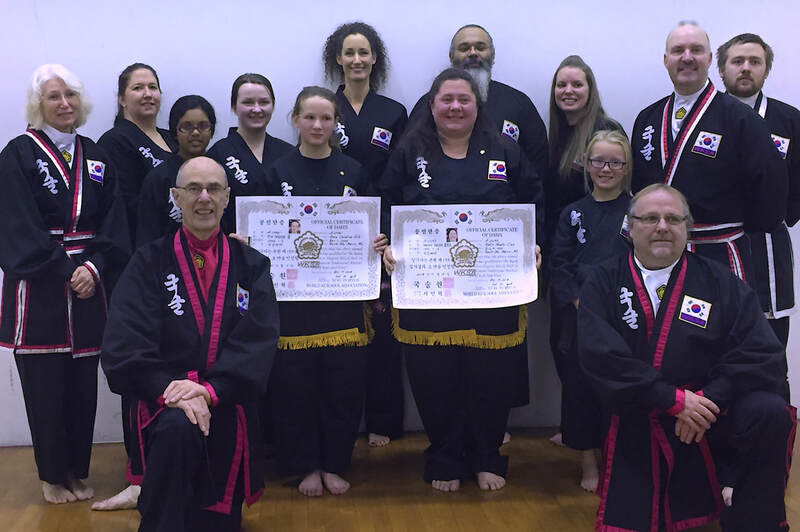 The new Jo Kyo Nims tested quarterly during the last two years, either before the Grandmaster & visiting masters, or with their local instructors. physical endurance. 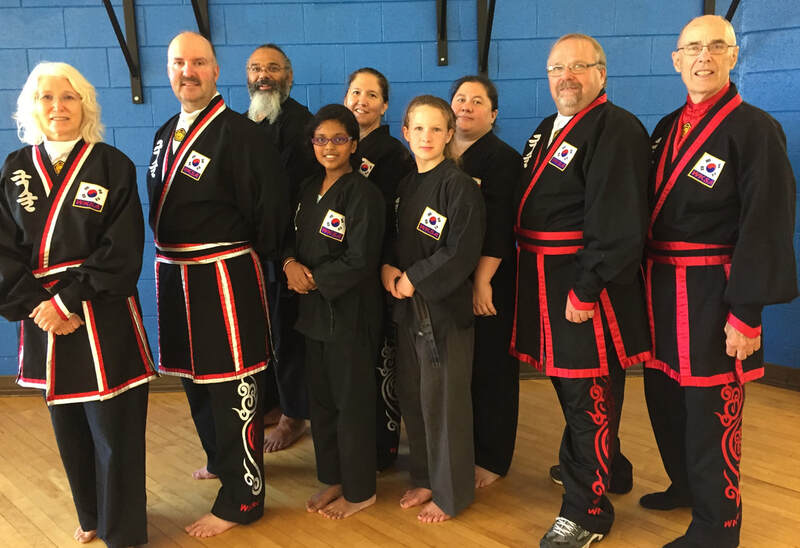 This advancement in rank in the martial art style of Kuk Sool Won™ is most definitely an accomplishment of which they may be very proud. 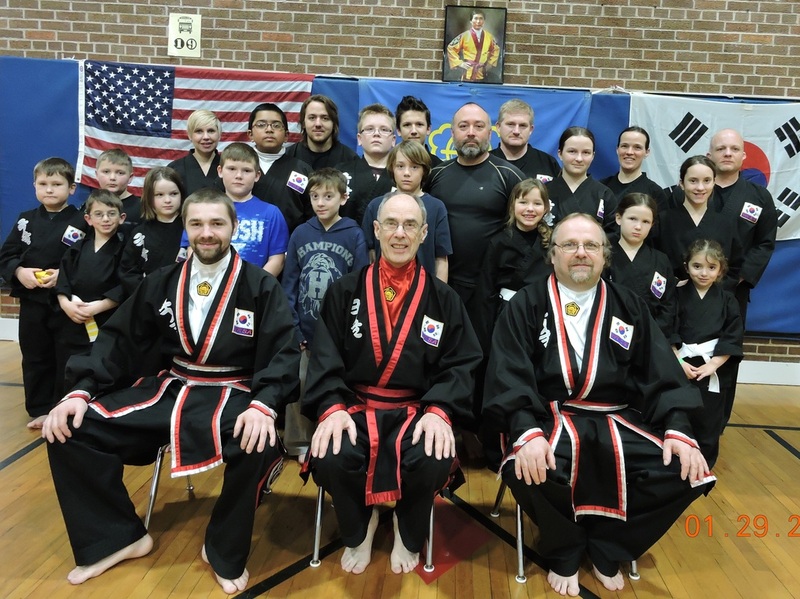 Washington Elementary School with instructors Karl Stolt PKJN, Benjamin A. Forejt SBN, and Benjamin A. Forejt II SBN. 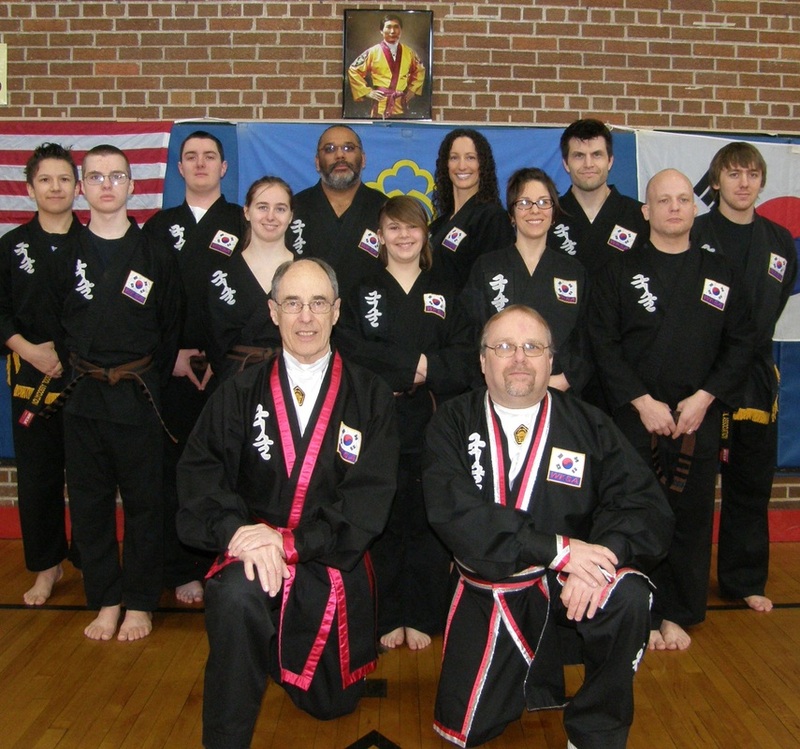 Back row, left to right. 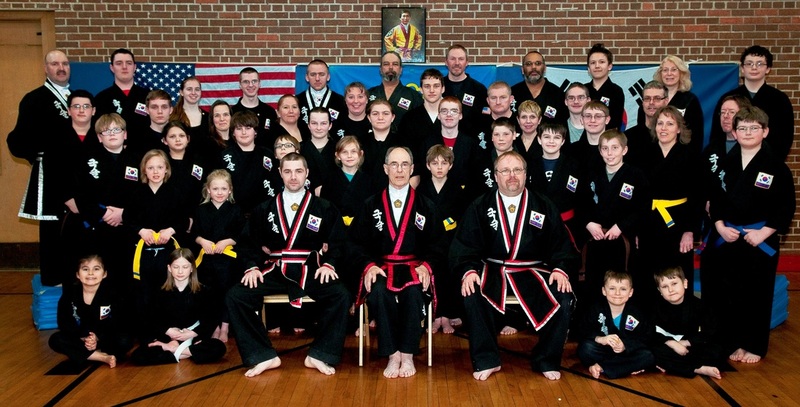 JKN Austin Teeple, DBN Corbin McConnell, JKN Dr. Chris Hall, DBN Rachel Reinke, DBN Ryan Mosher, JKN Dylan Floyd. 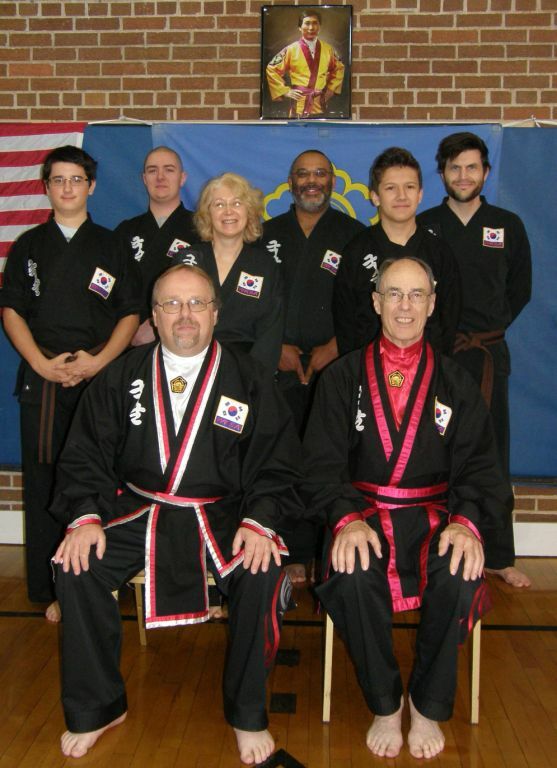 Second row, left to right. 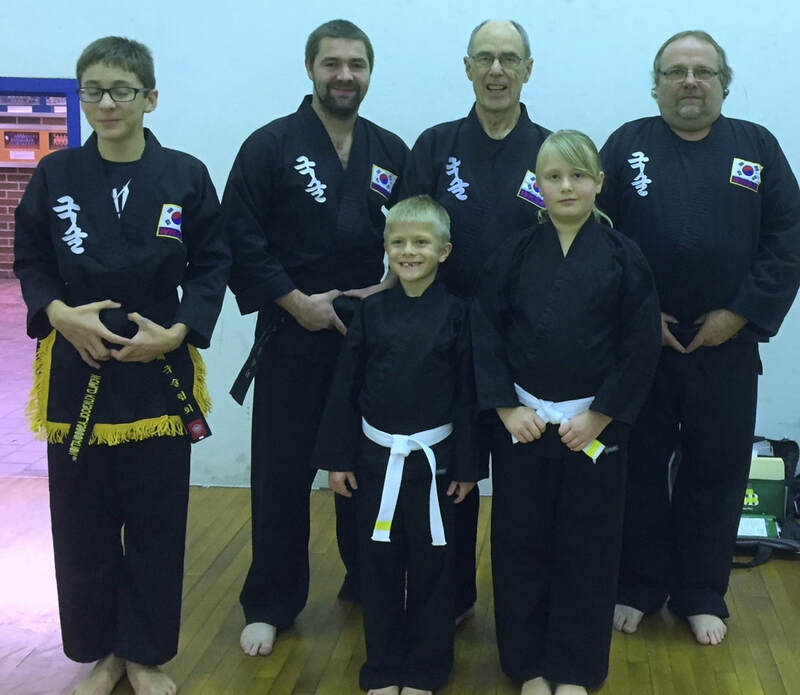 DBN Dyllan Uplinger, DBN Amber Uplinger, DBN Kaya Beaudoin, DBN Kori Korcal, DBN Adam Mohagen. Front row, left to right. PKJN Karl Stolt, SBN Ben Forejt. "Dae Dahn Hee Kahm Sah Hahm Nee Dah." to you SIKJN Sung Jin Suh. Alyssa Fishell and her father Pat Fishell recently completed their journey to the rank of second degree black belt in the Korean martial art style of Kuk Sool Won™. Canada, and the United States. 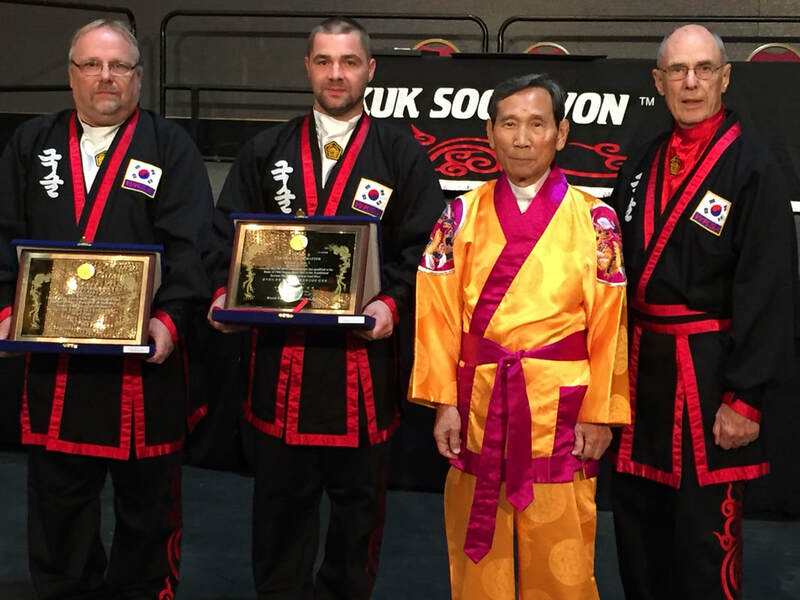 The grandmaster was accompanied by Kuk Sool Won™ Master Sung Jin Suh, Master Barry Harmon, and Master Darren Hart. 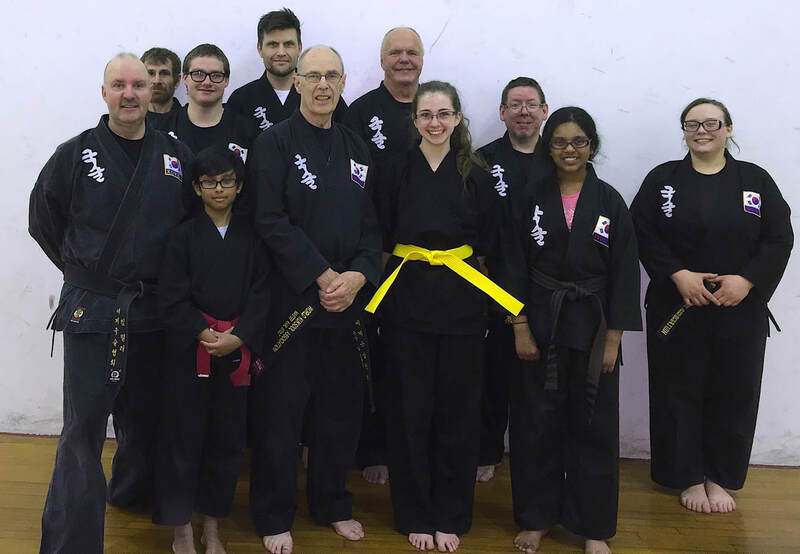 The seminar team conducted a two-hour test for local students who are testing for advancement to 1st degree black belt and higher degrees of black belt. 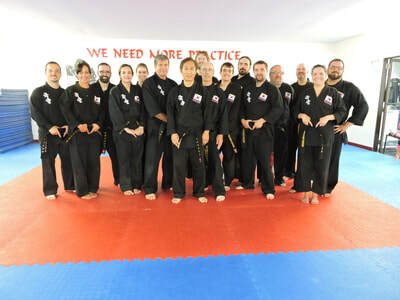 After testing the seminar team held a three-hour seminar for instructors and students of all belt levels. 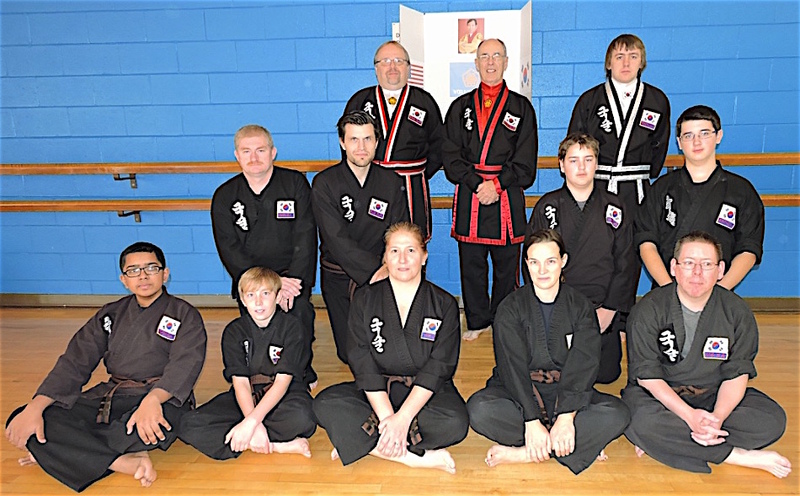 The seminar concluded with promotions. 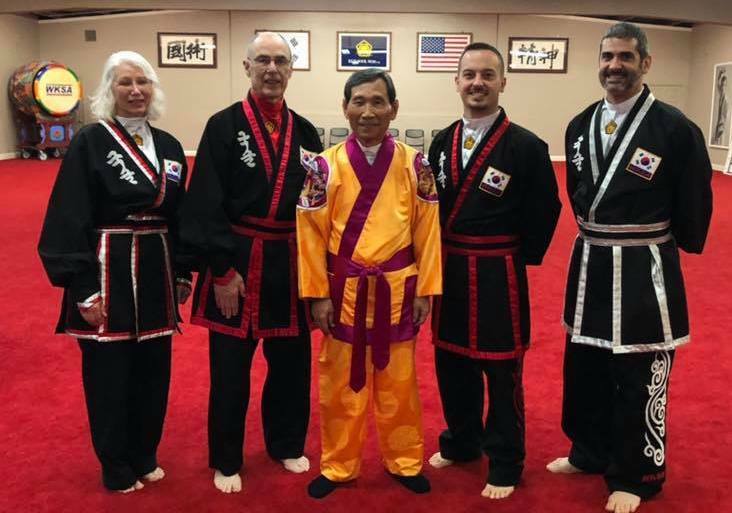 The new Kyo Sa Nim’s tested many times during the last two years, sometimes before the Grandmaster & visiting masters, and often before their local instructors. The tests involve a considerable amount of memory and physical endurance. Earning the rank of 2nd degree black belt in the martial art style of Kuk Sool Won™ is most definitely an accomplishment of which be justifiably . Alyssa father at Washington Elementary School with instructors Karl Stolt, Ben Forejt, and Ben Forejt II. black belt or a higher degree of black belt. 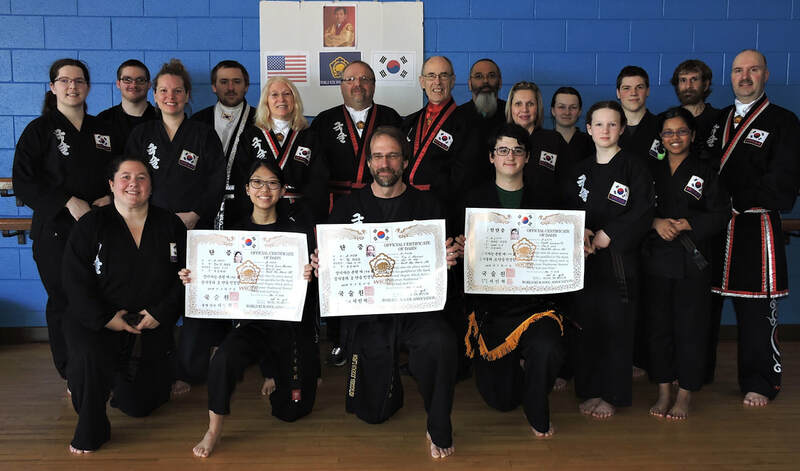 At the conclusion of the tournament Grandmaster In Hyuk Suh promoted local martial art students Tim Harrow, Jinny Harrow, and Henry Shackleton to the rank of first degree black belt (Jo Kyo Nim) in the Korean martial art style of Kuk Sool Won™. The new Jo Kyo Nims all tested quarterly during the last two years, sometimes before the Grandmaster & visiting masters, and often before their local instructors. The tests involve a considerable amount of memory and physical endurance. 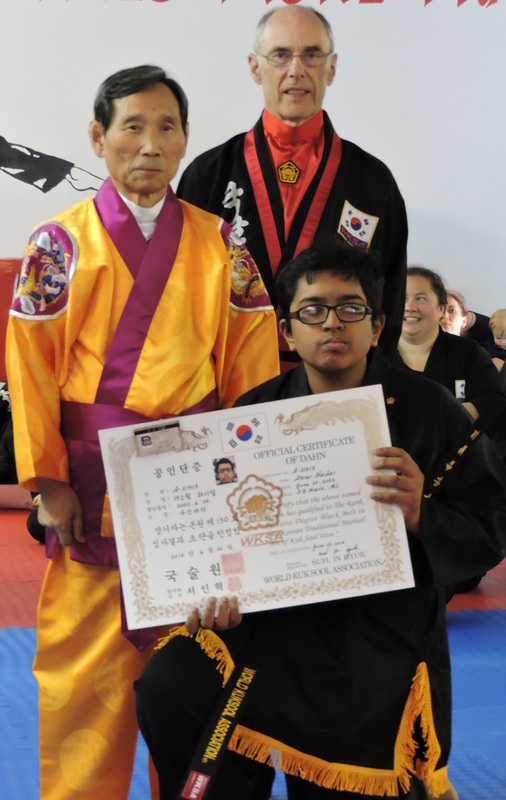 This advancement in rank in the martial art style of Kuk Sool Won™ is most definitely an accomplishment of which they may be justifiably proud.